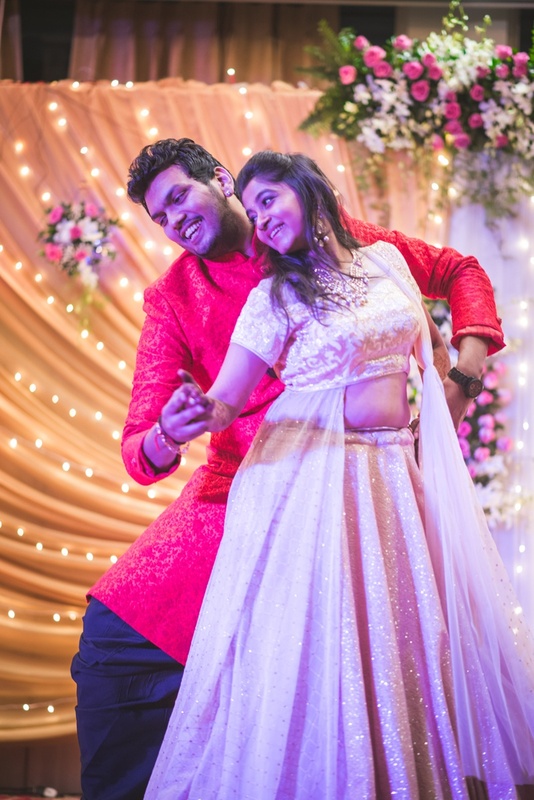 We have a special space in our hearts for this happy-young-dancy couple who discovered their love for each other through the art of dance. 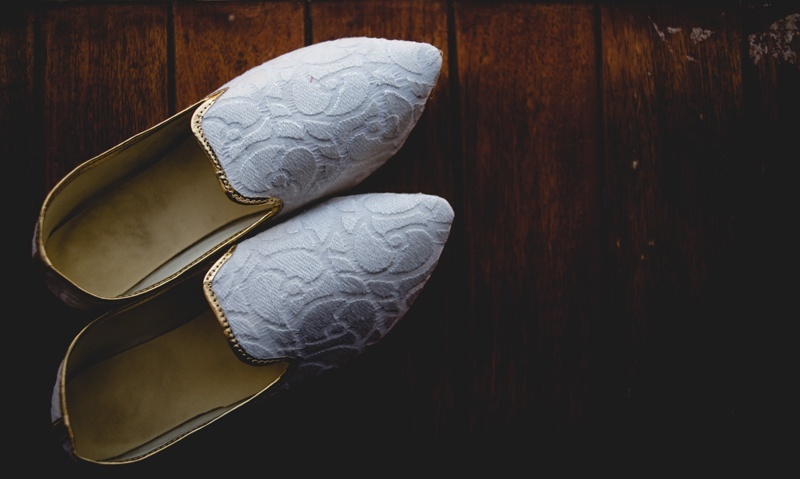 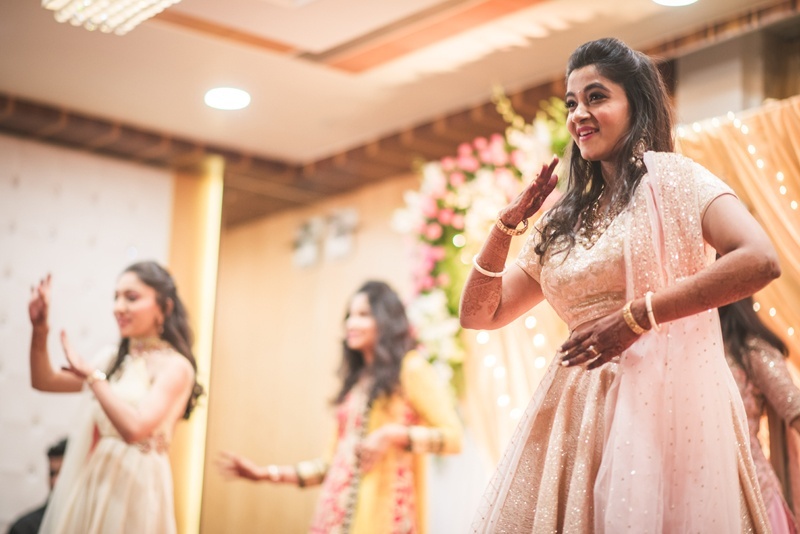 “It’s always been dance” says this gorgeous bride as she tells us her story of love. 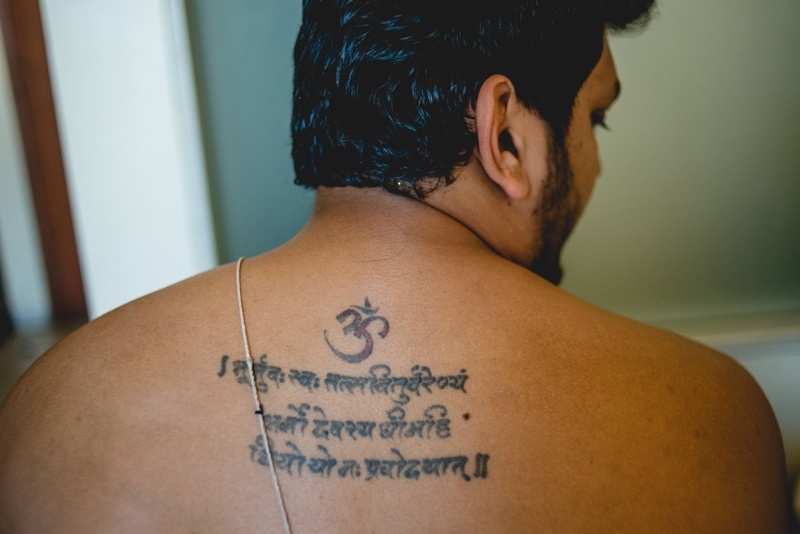 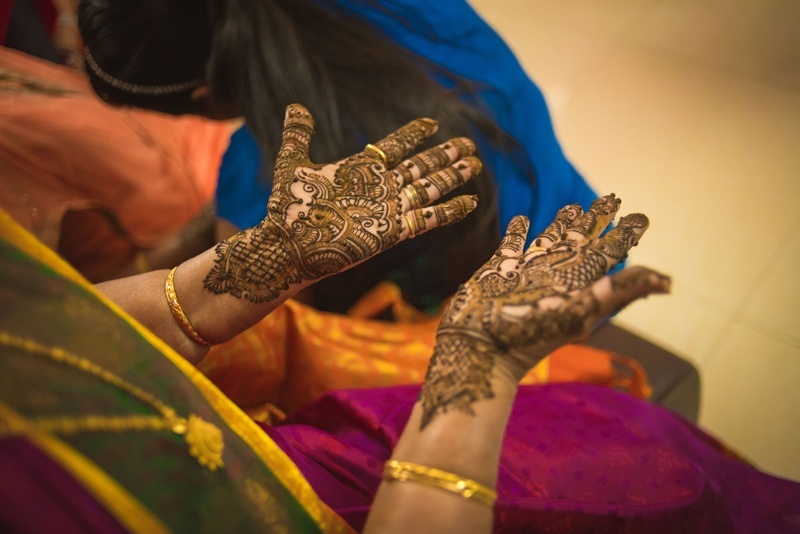 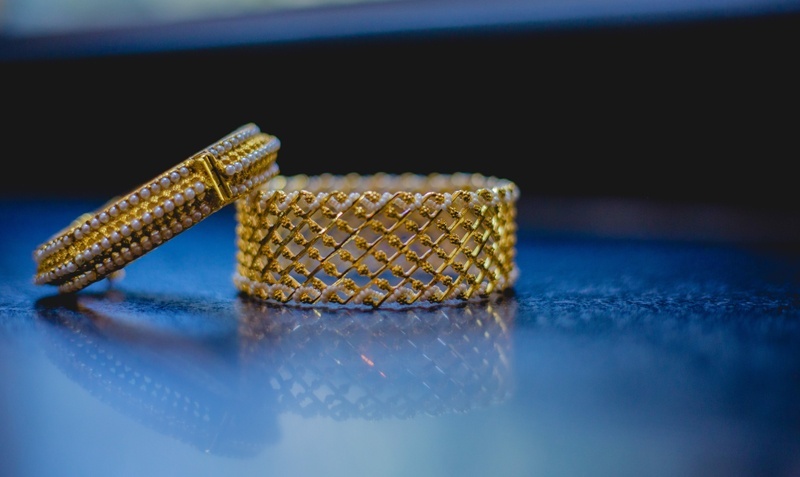 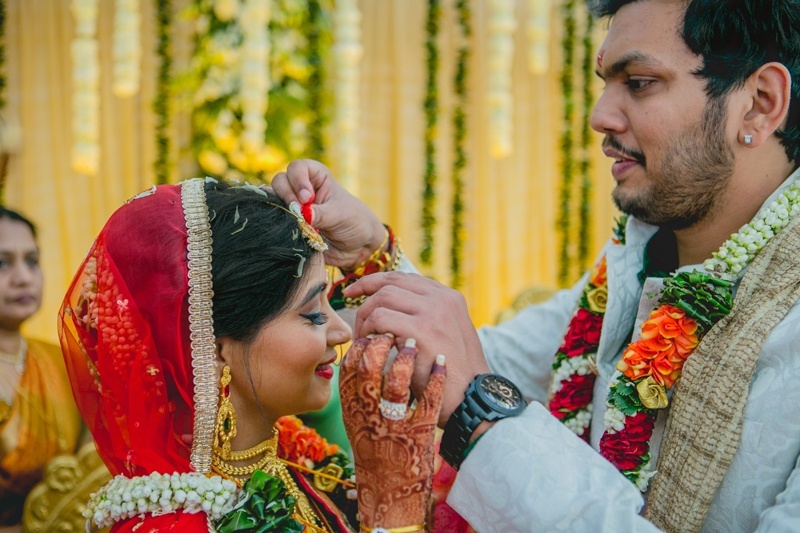 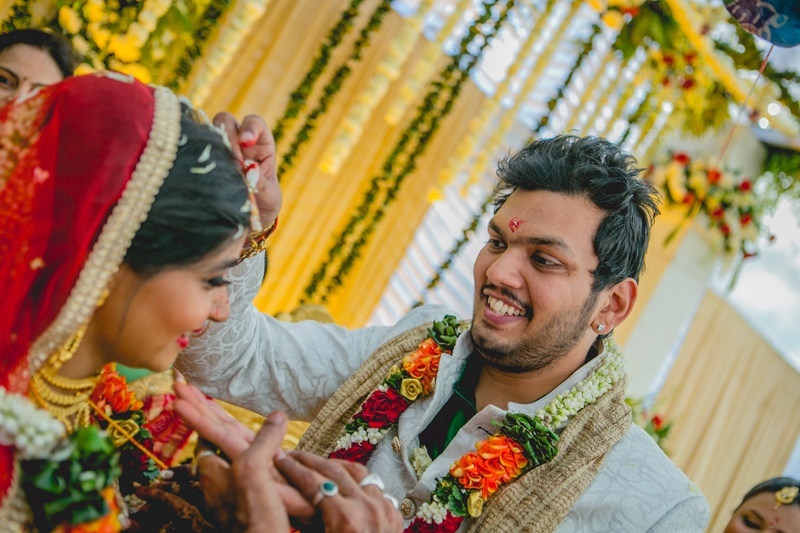 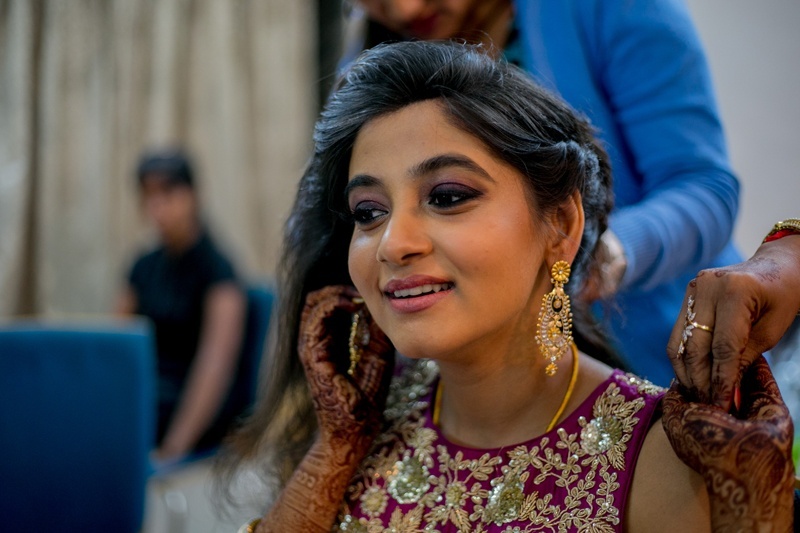 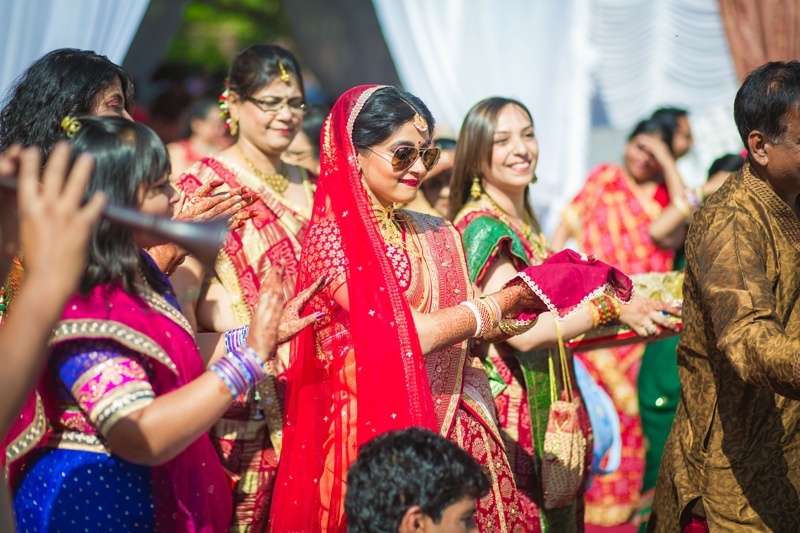 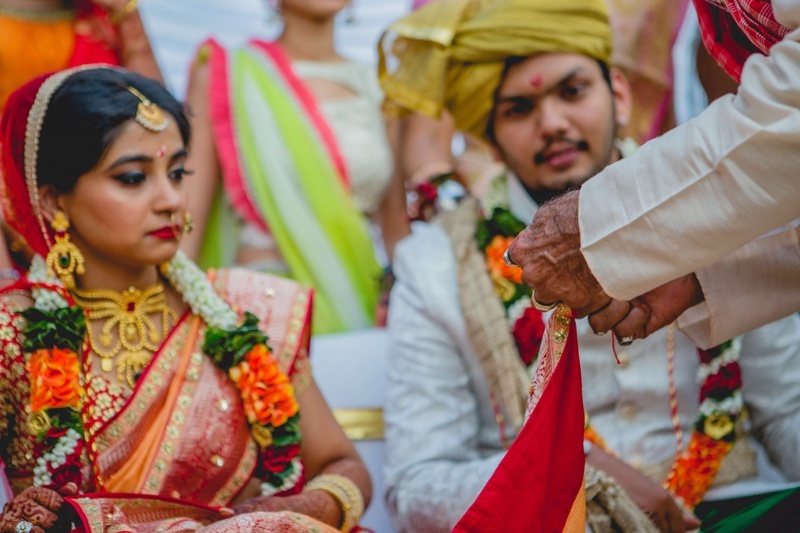 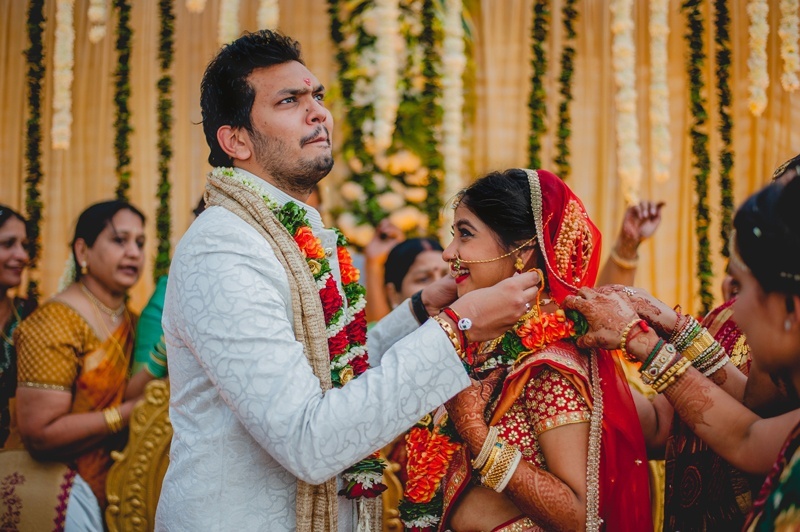 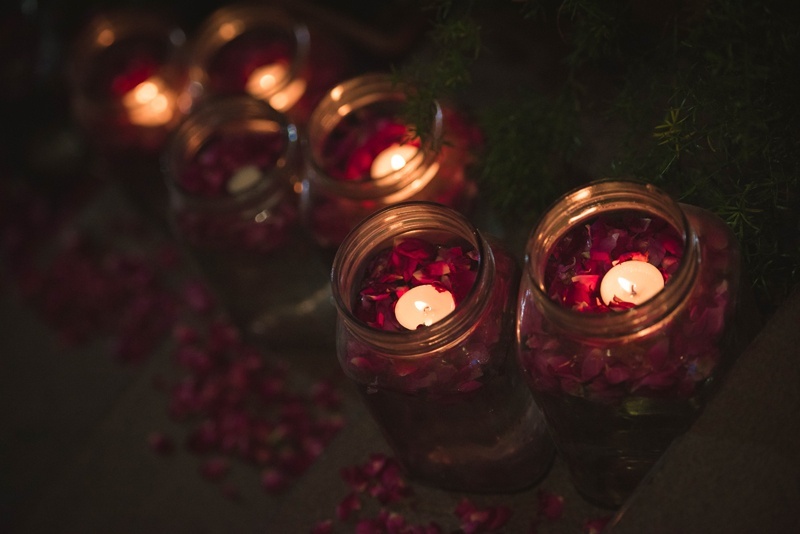 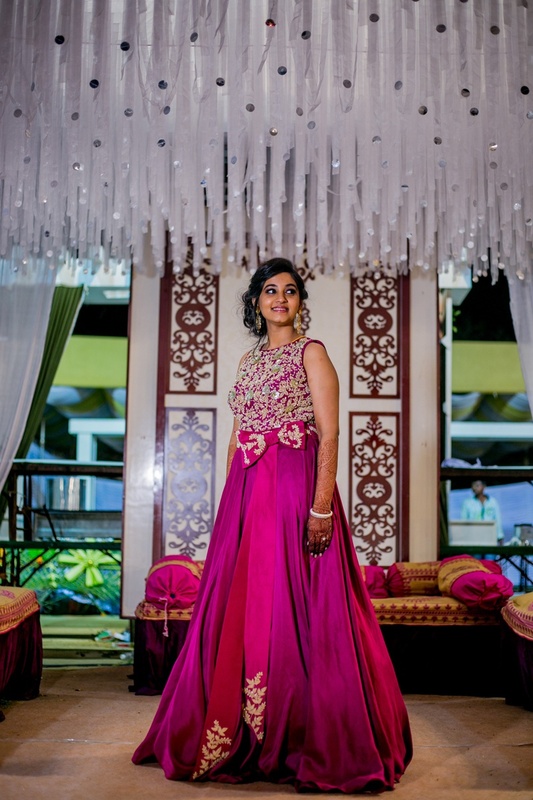 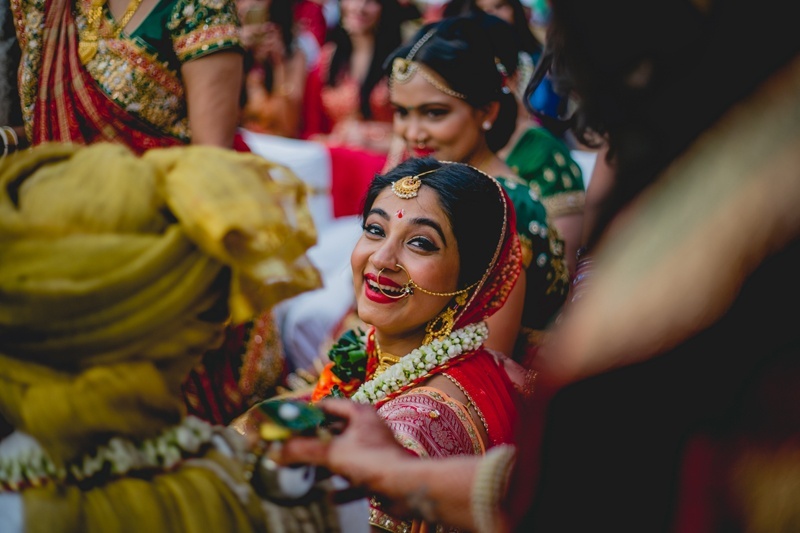 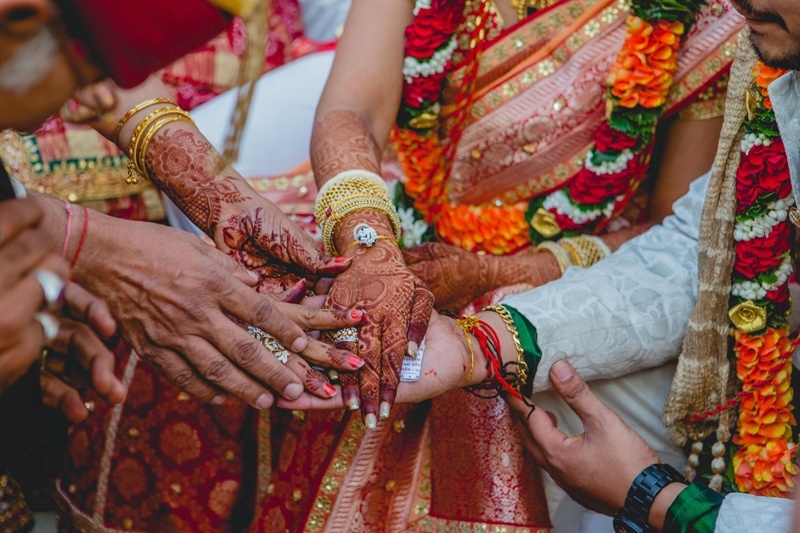 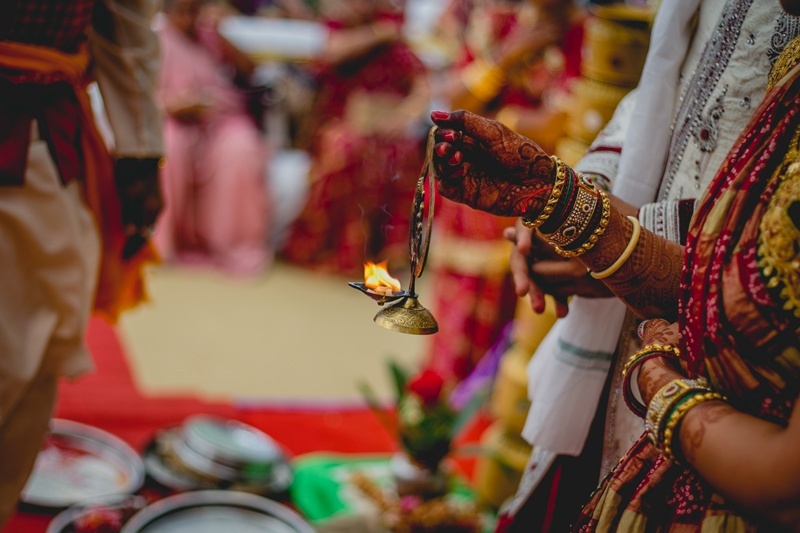 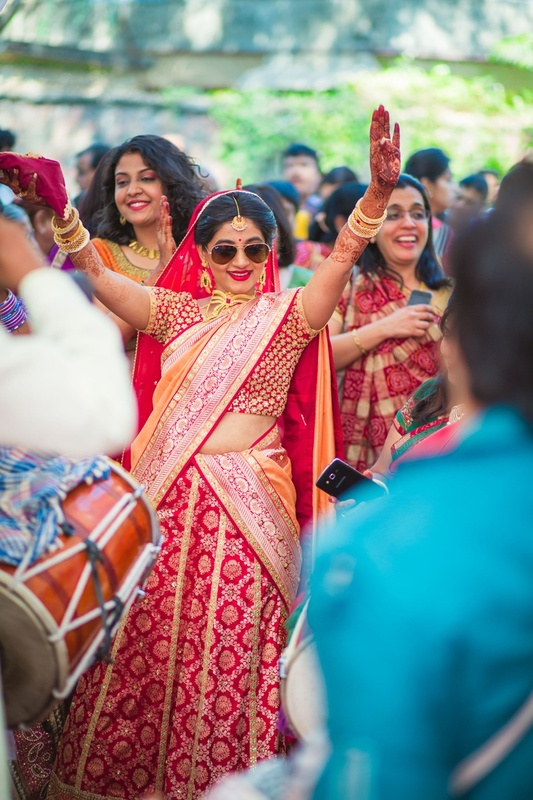 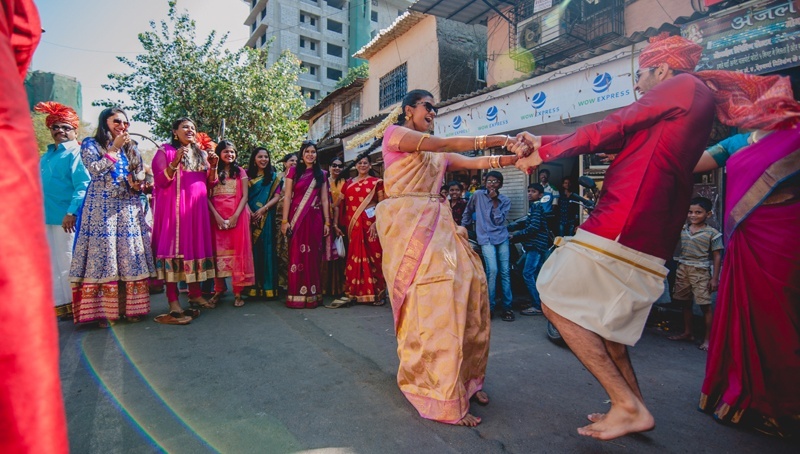 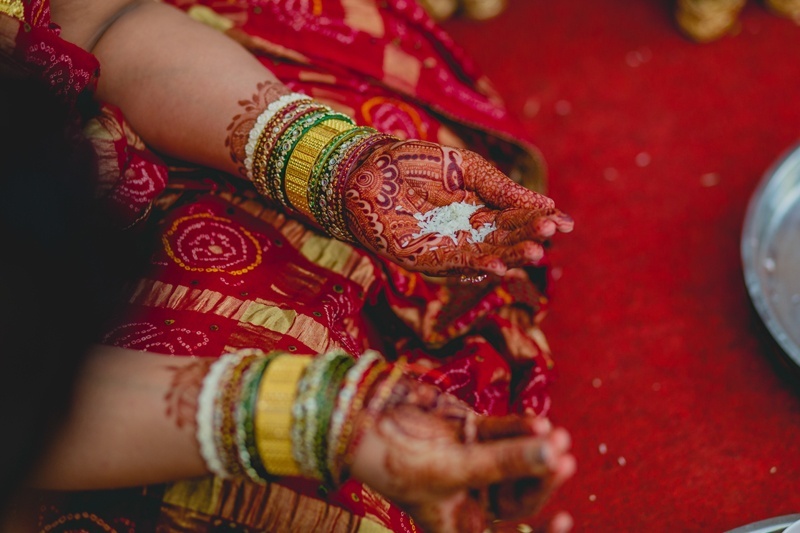 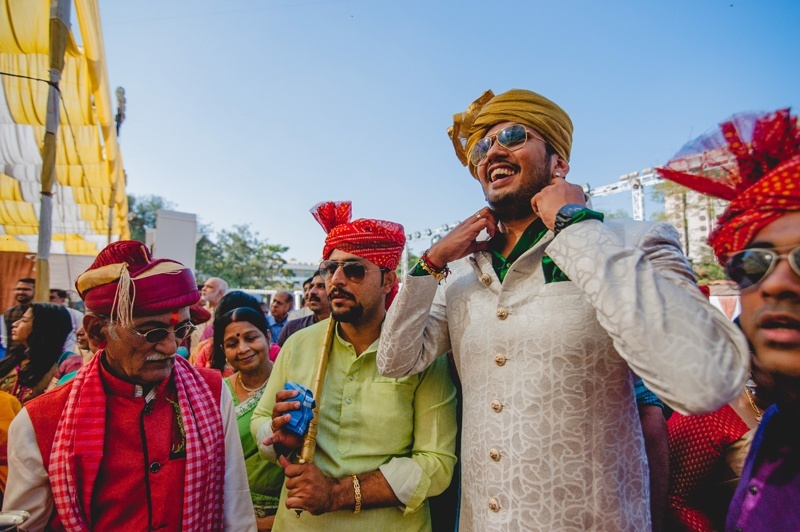 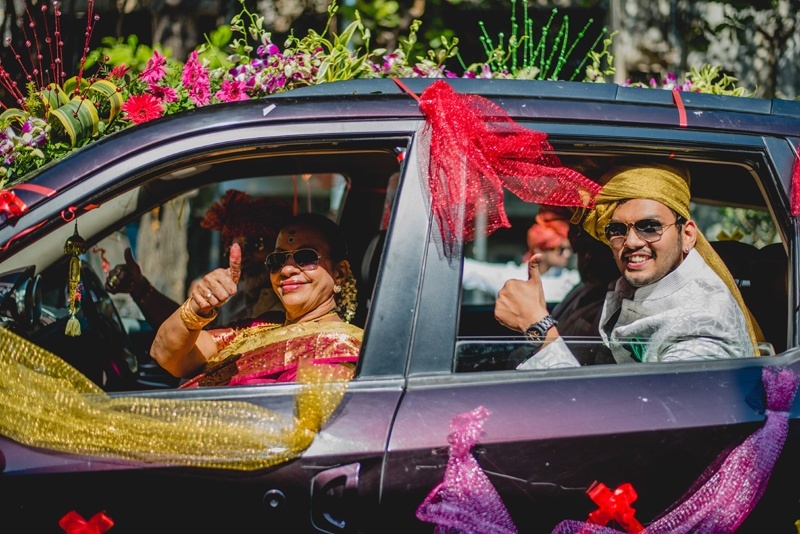 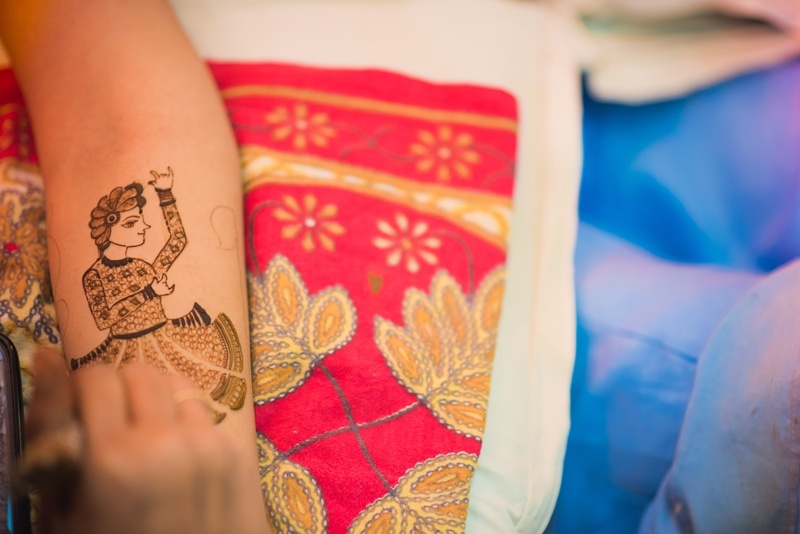 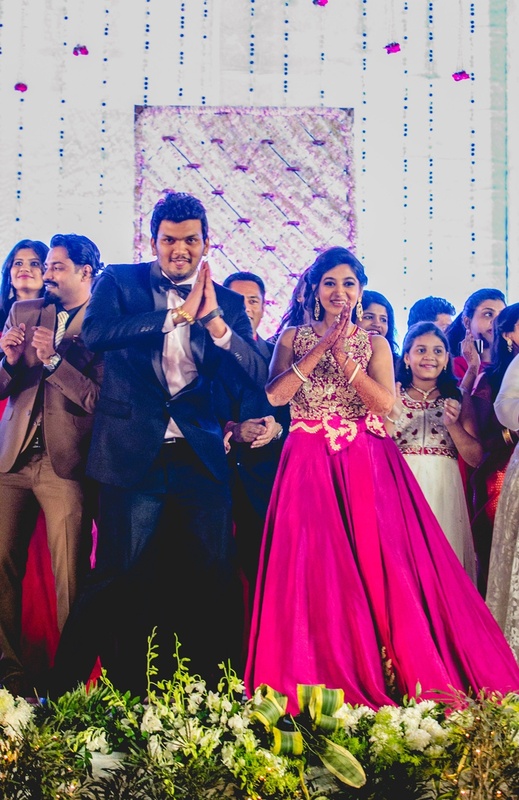 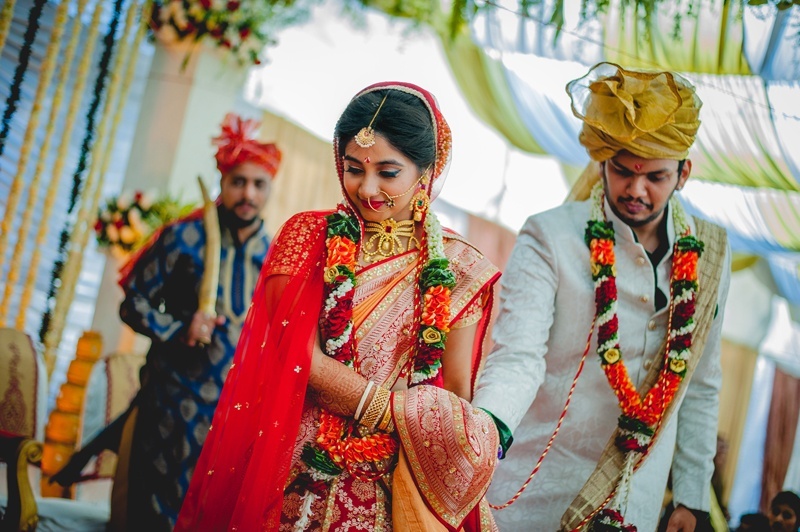 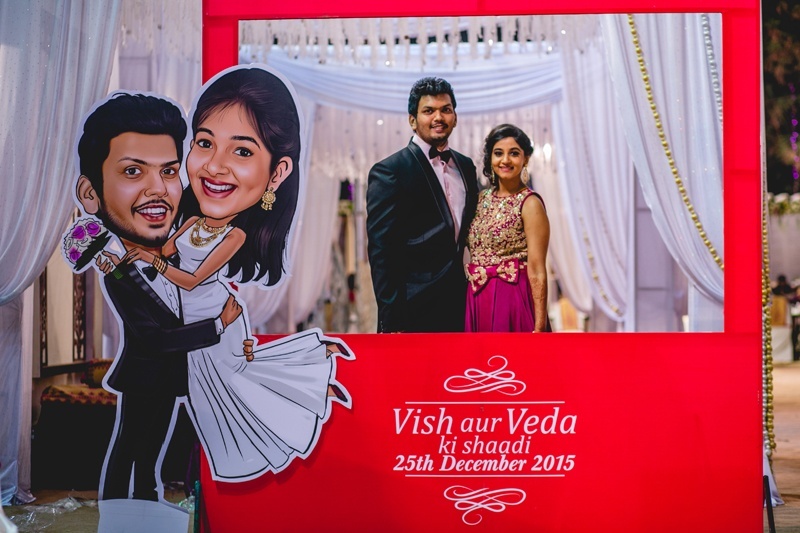 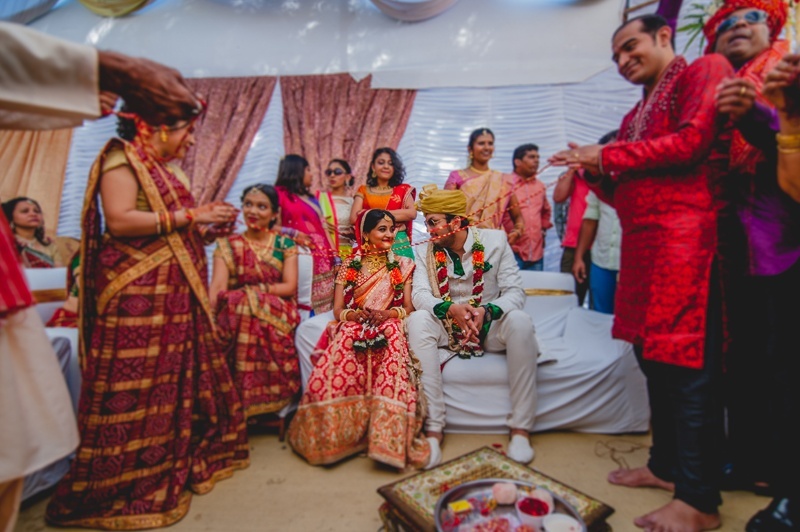 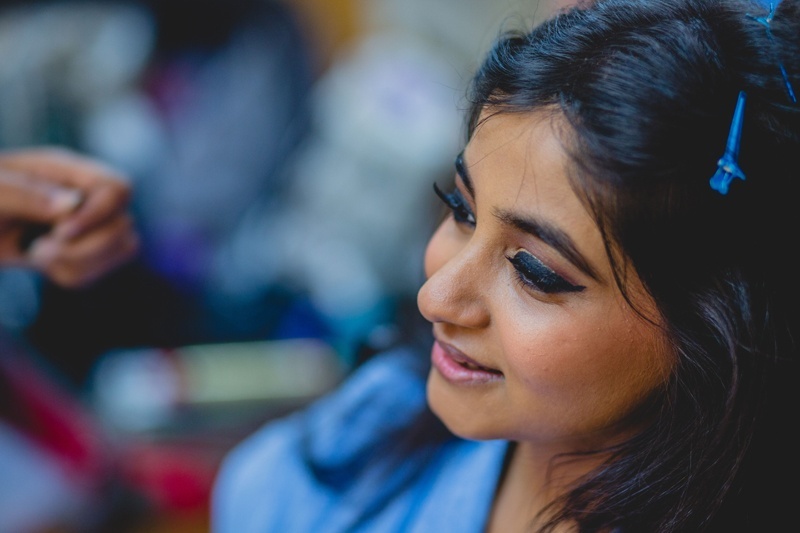 Vishwanath and Veda both used all the elements of their cross-cultural marriage in every element of the wedding – mixing up the south-Indian and Gujarati components perfectly. 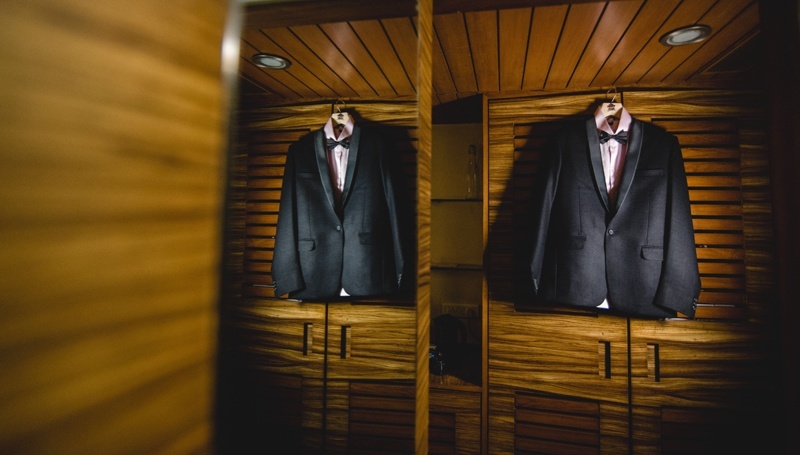 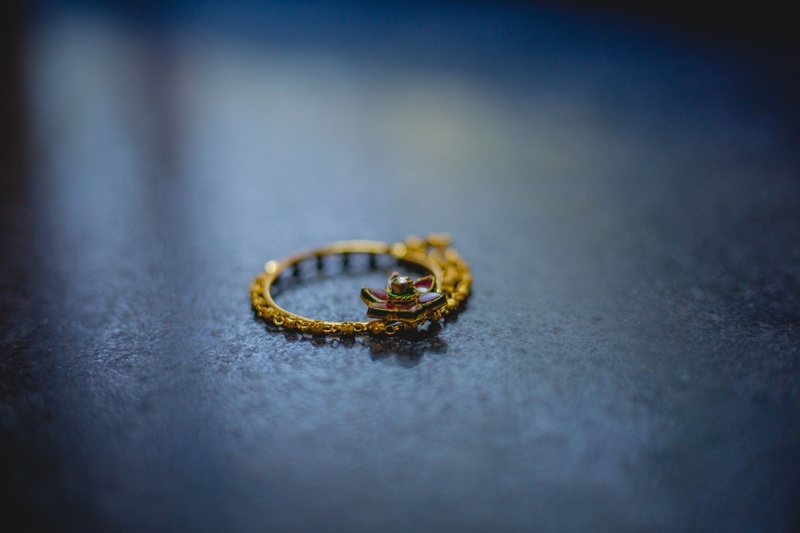 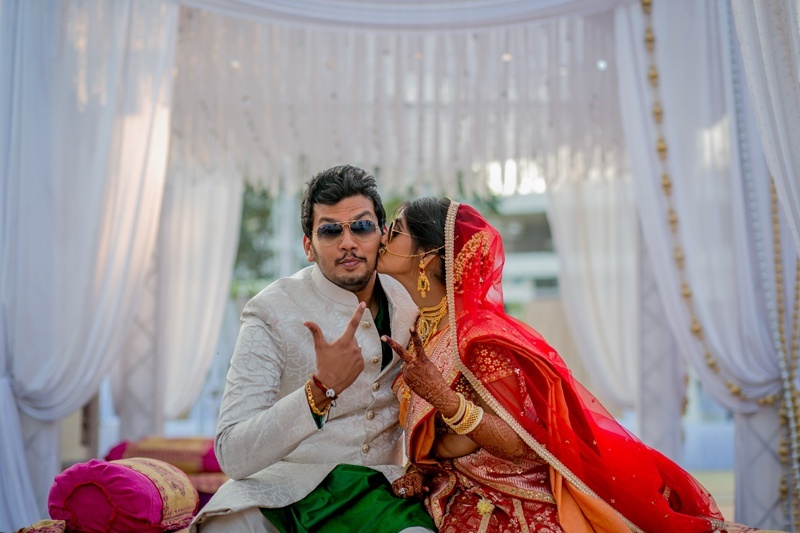 The team at Fotografia 9 shot this wedding brilliantly using crazy-awesome skill and a keen eye for detail creating an end result that had us aw-ing our hearts out! 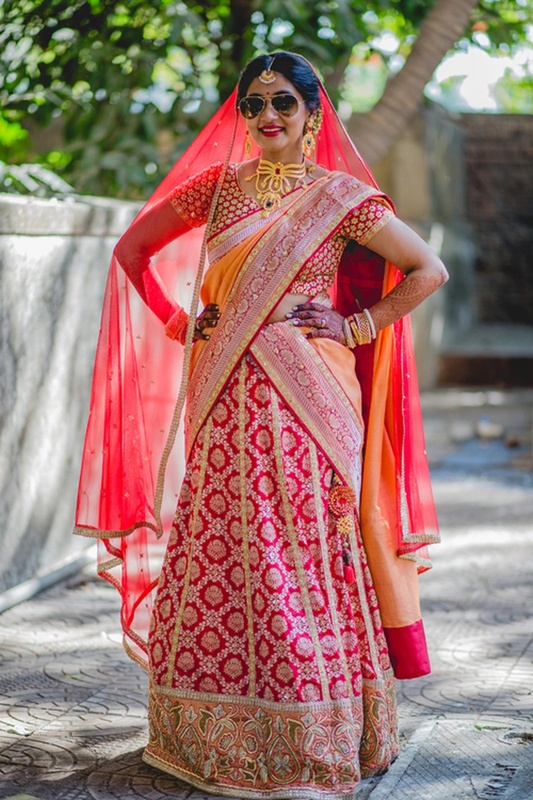 This gorgeous bride took it to the next level with her uber chic mehndi outfit – conceptualized and executed by ace designer Ishani Kamdar of ISKA Collections, who paired a sky blue croptop and palazzos with a contrasting orange mirror-worked jacket – it was absolute prettiness! 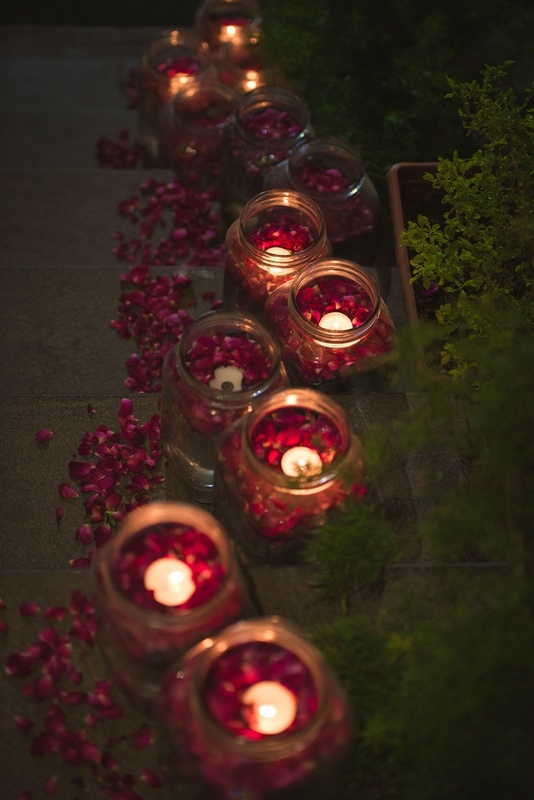 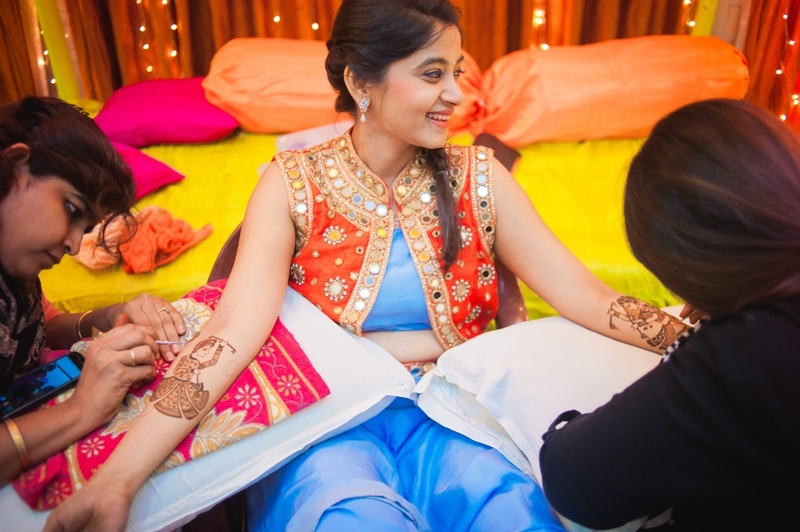 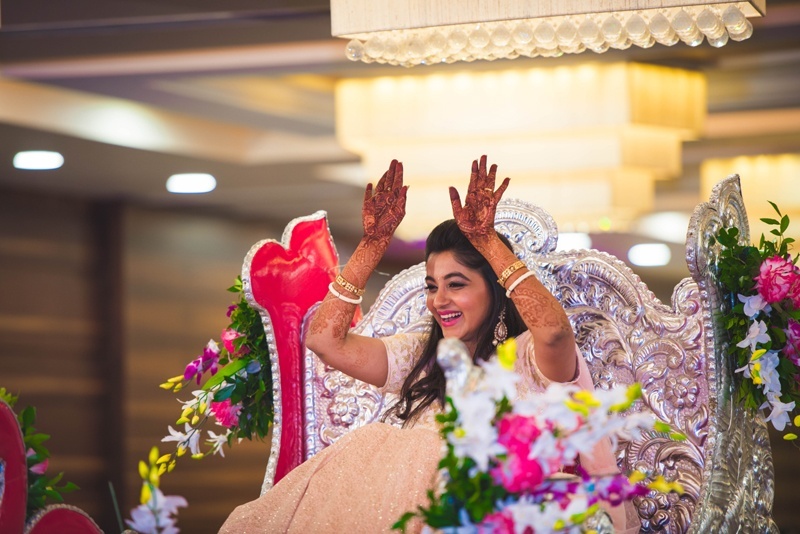 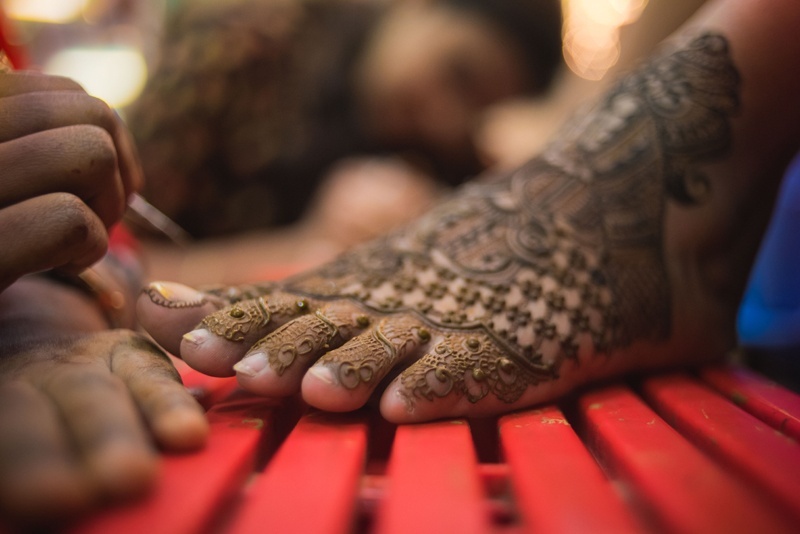 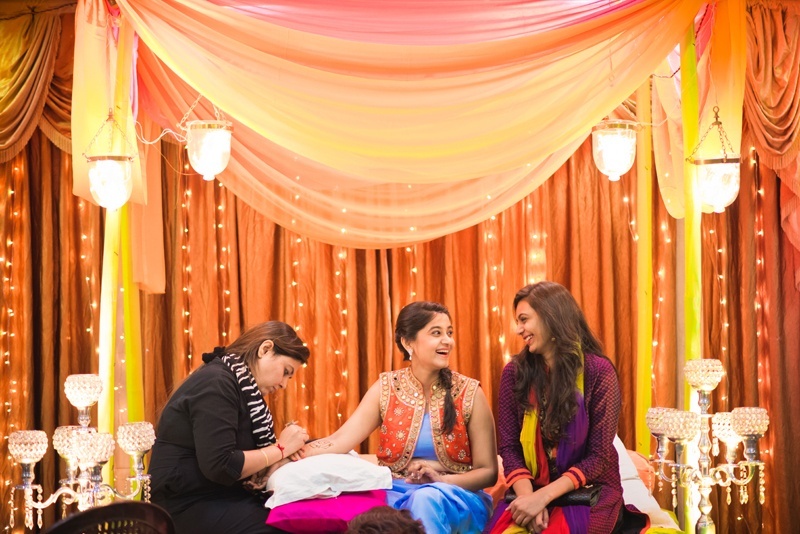 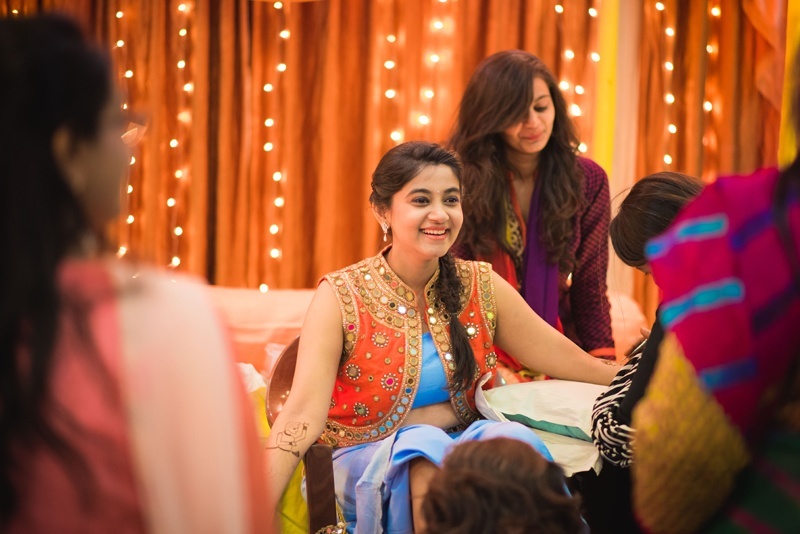 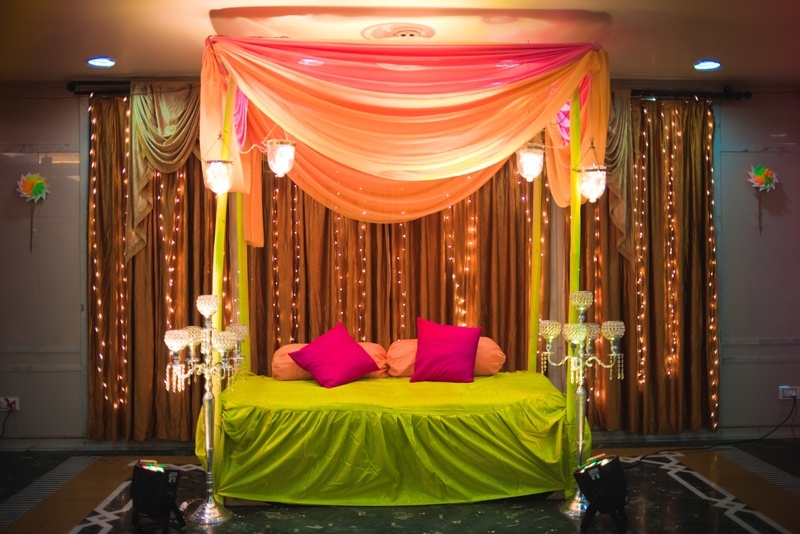 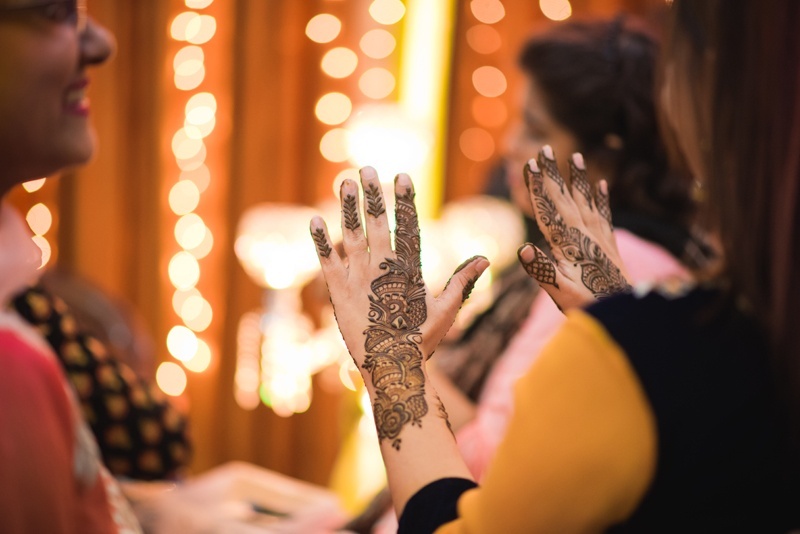 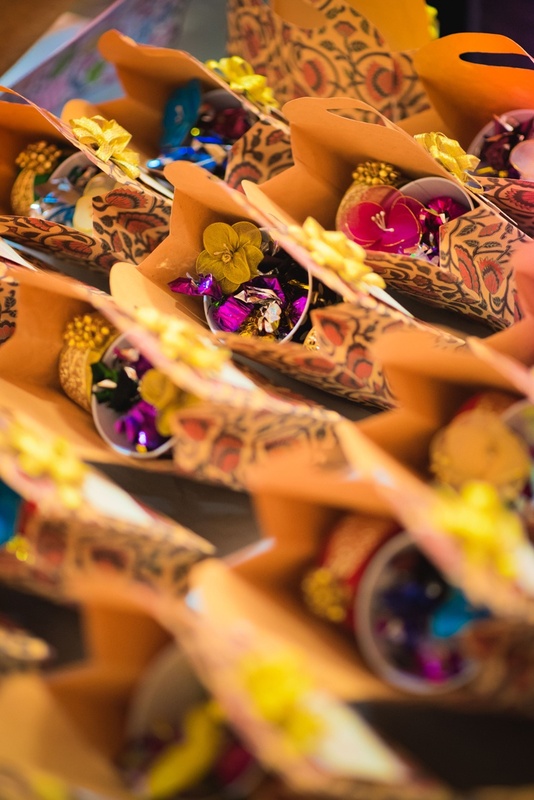 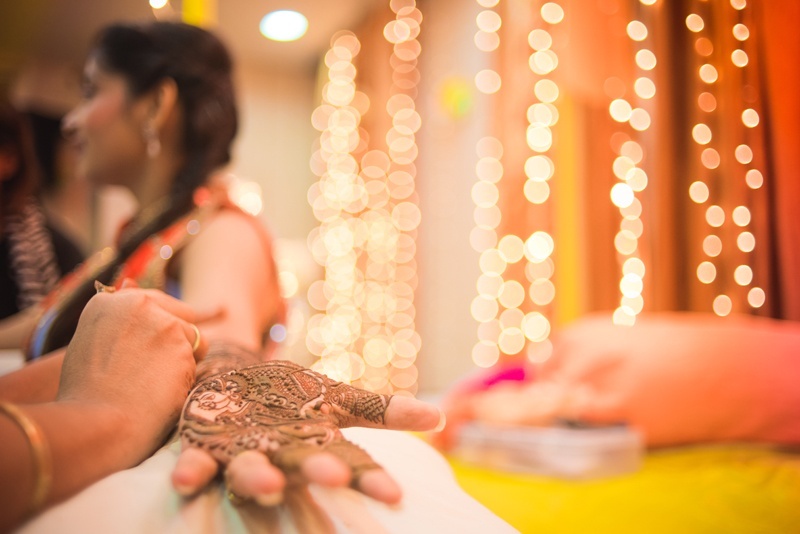 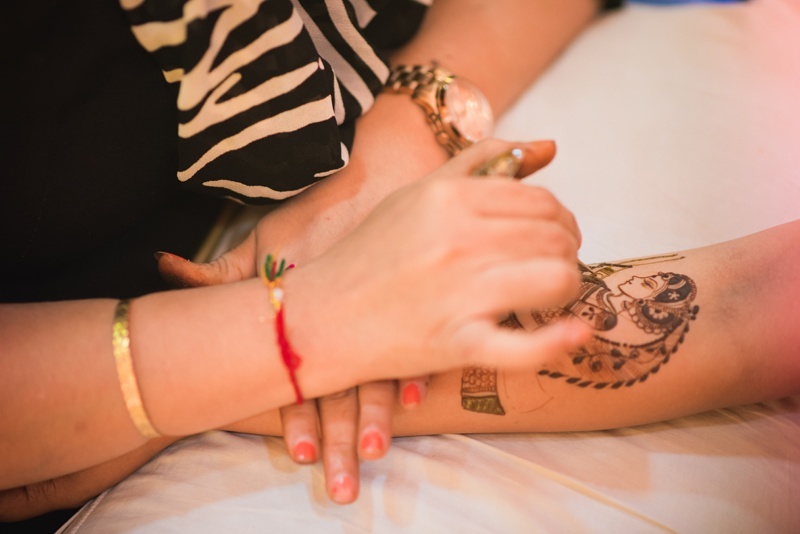 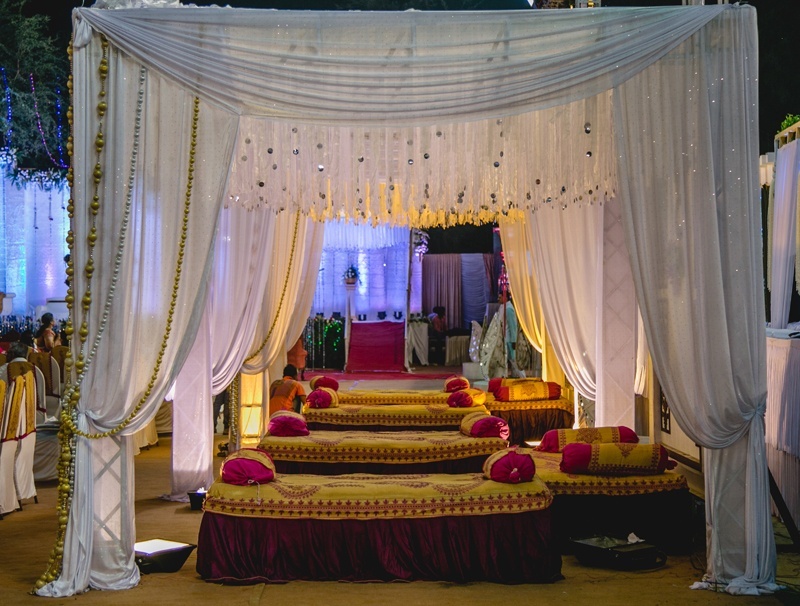 Her mehndi set up too brought a contemporary Mughal era like vibe to the entire indoor space. 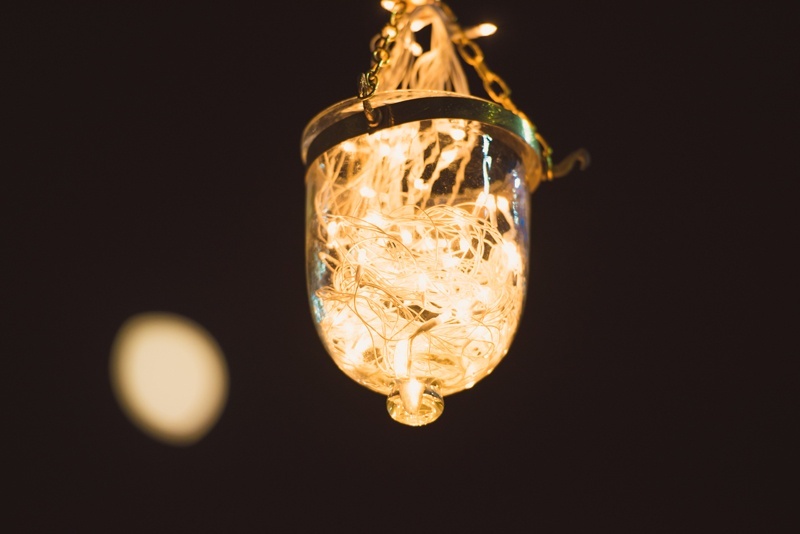 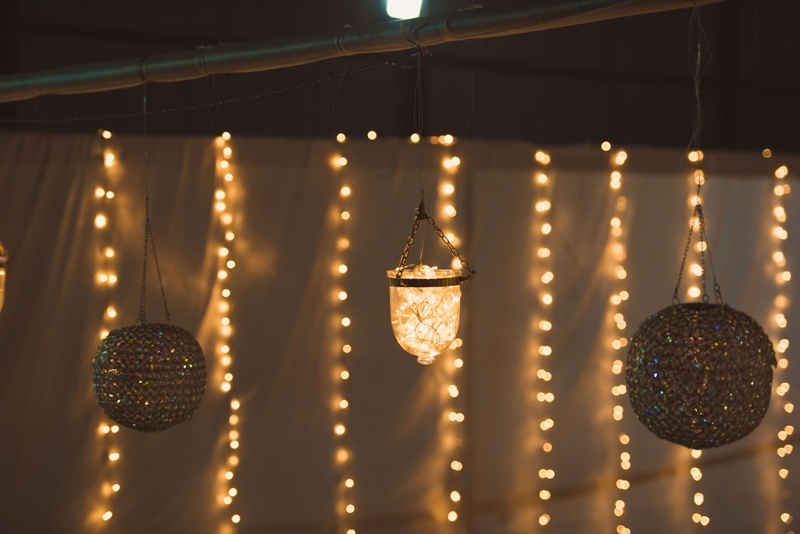 Sparkling fairylights on drapes, vintage crystal lamps paired with neon gaddis, and cute little stools that were used as armrests – our bride, Veda did it oh-so-right, mixing up the old and the new perfectly. 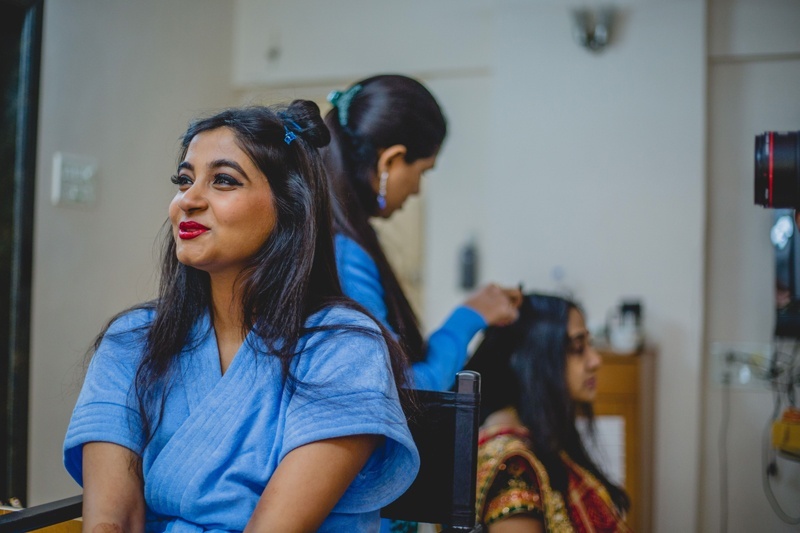 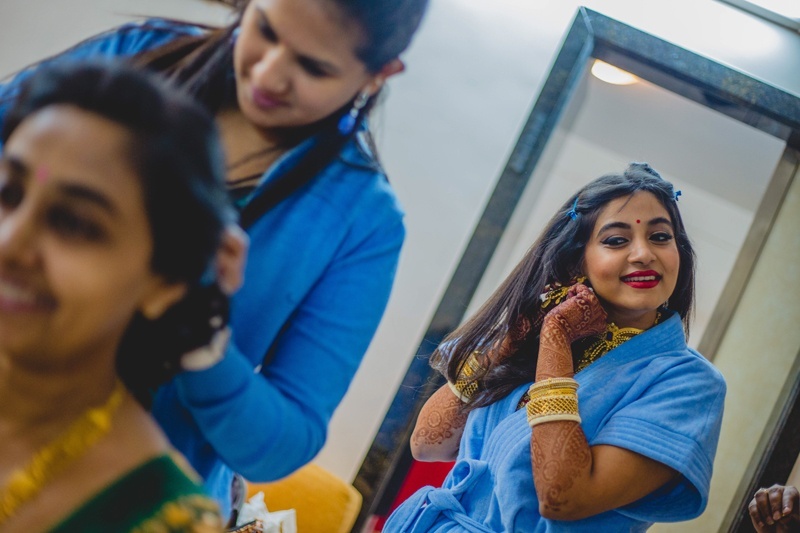 What we just couldn’t miss was the indigo blue mascara talented Makeup artist Jigna Savla added to Veda’s mehendi look to add an extra touch of contemporary to her entire ensemble. 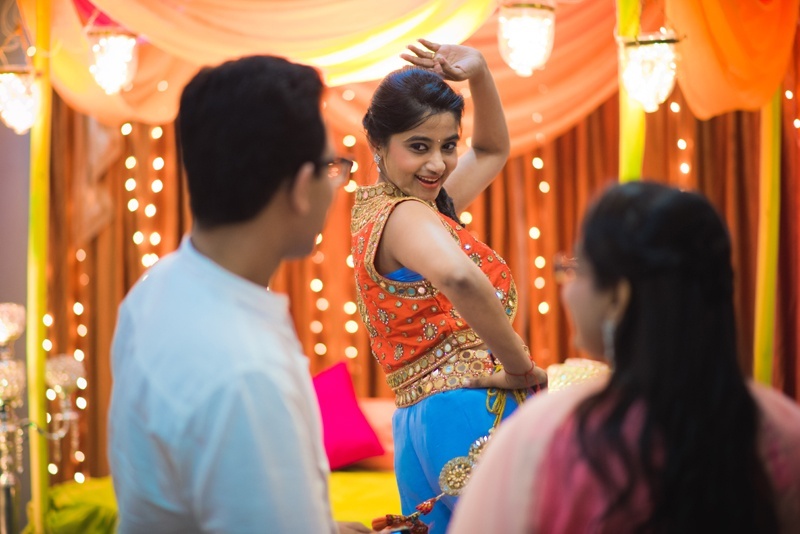 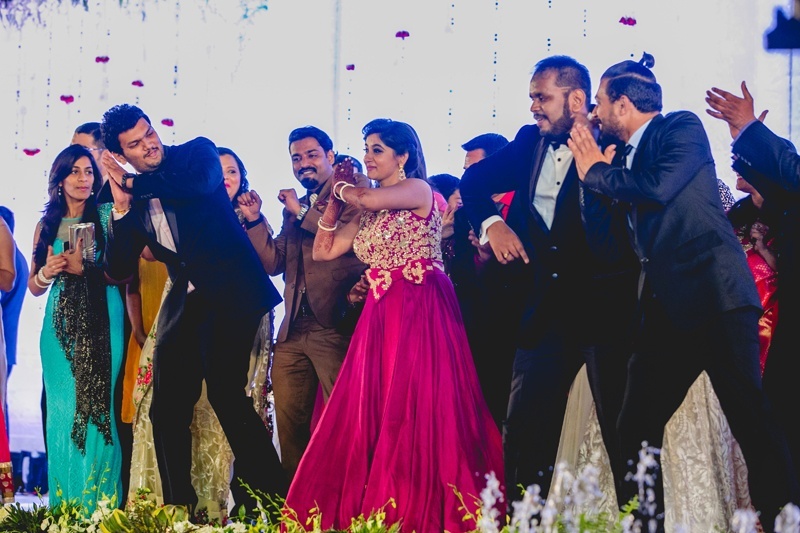 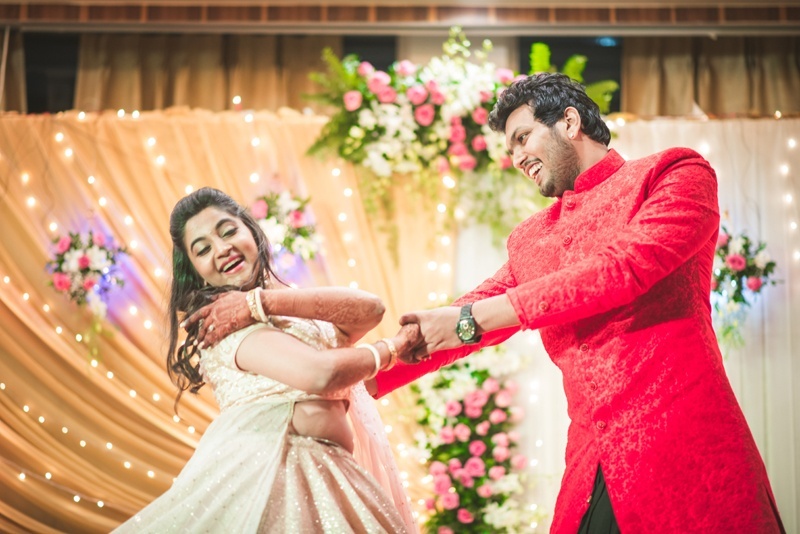 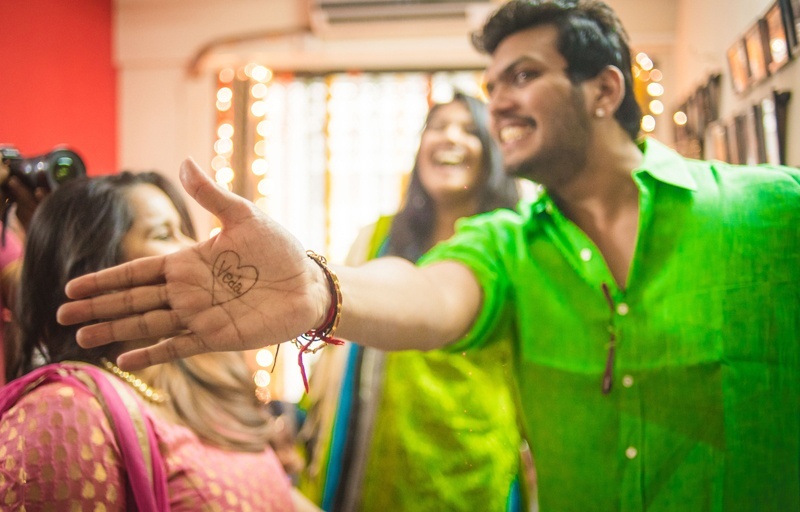 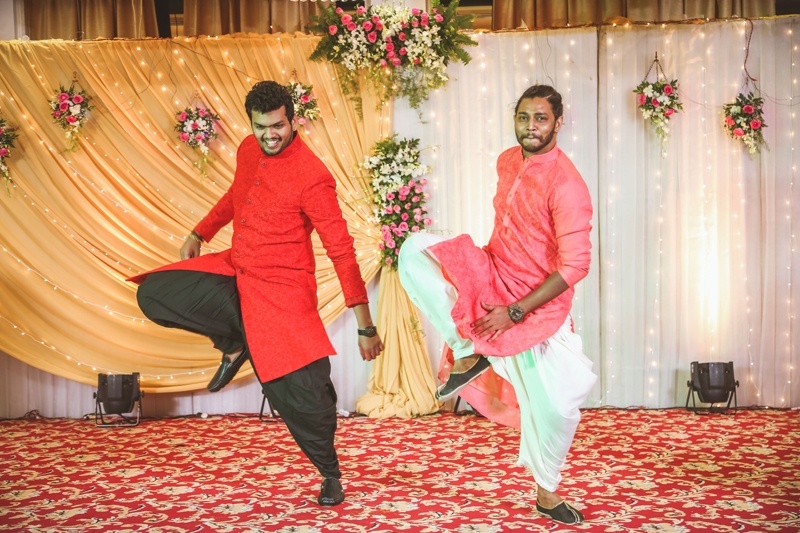 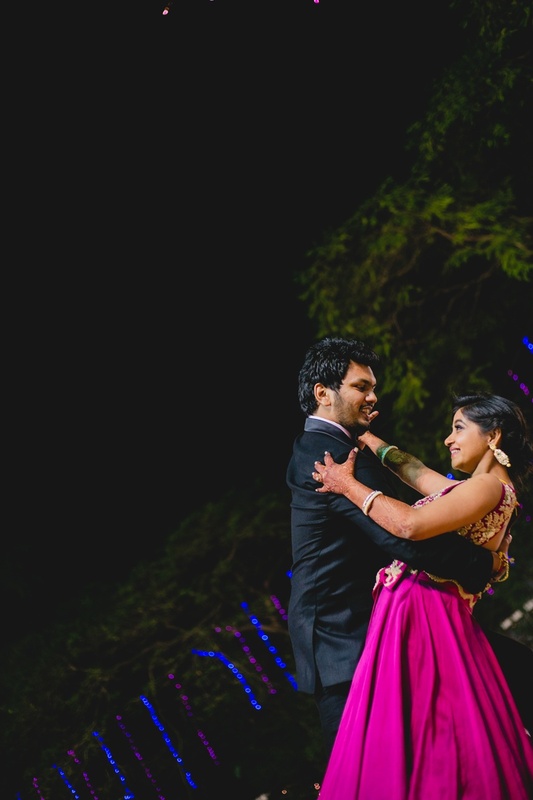 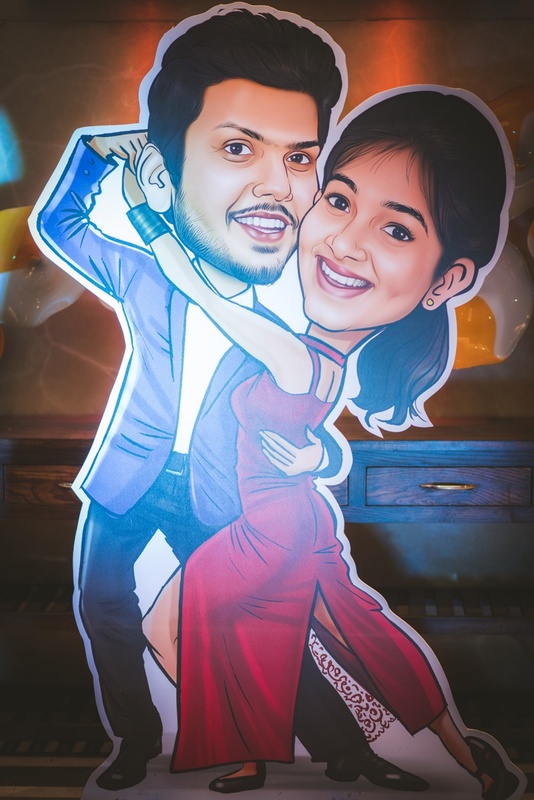 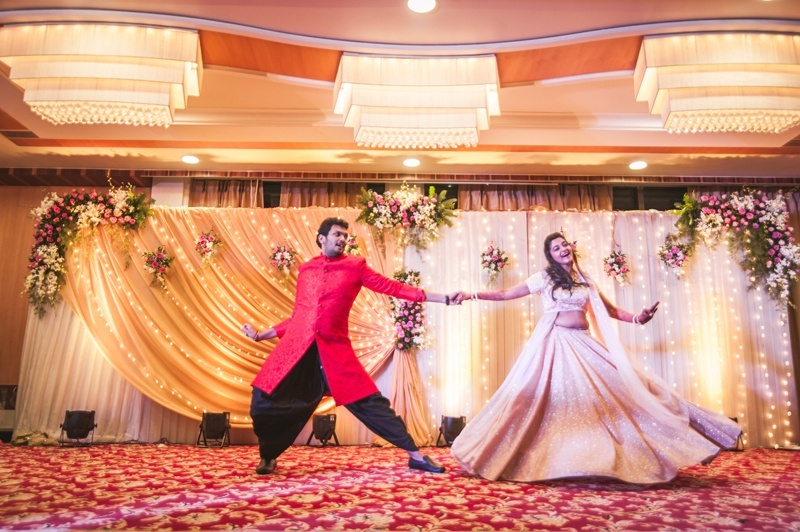 For a couple whose love sprung up from dance, this was surely one of the most fun pre-wedding events! 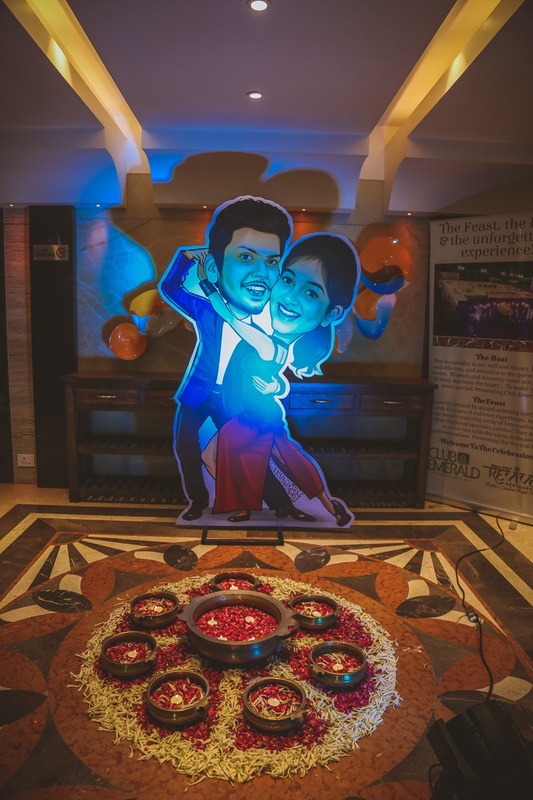 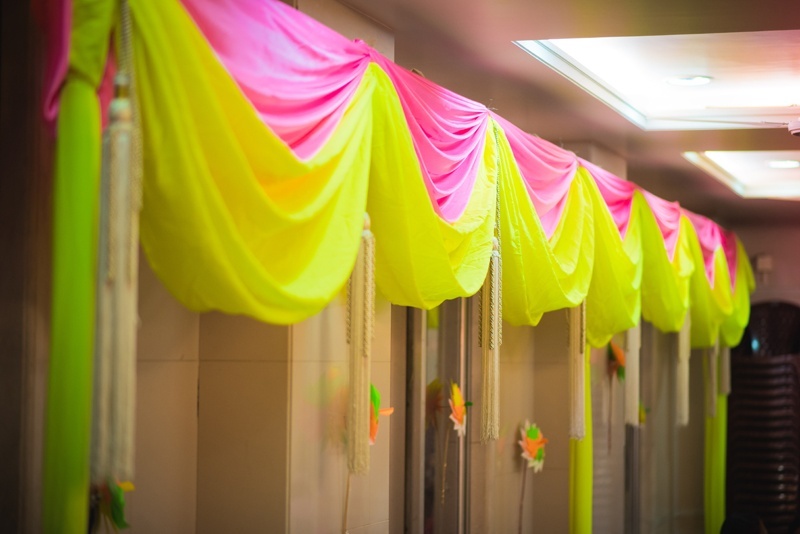 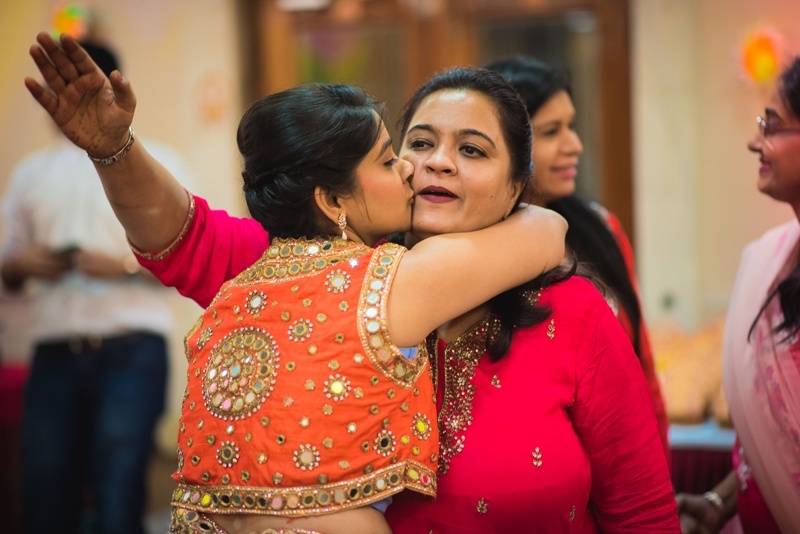 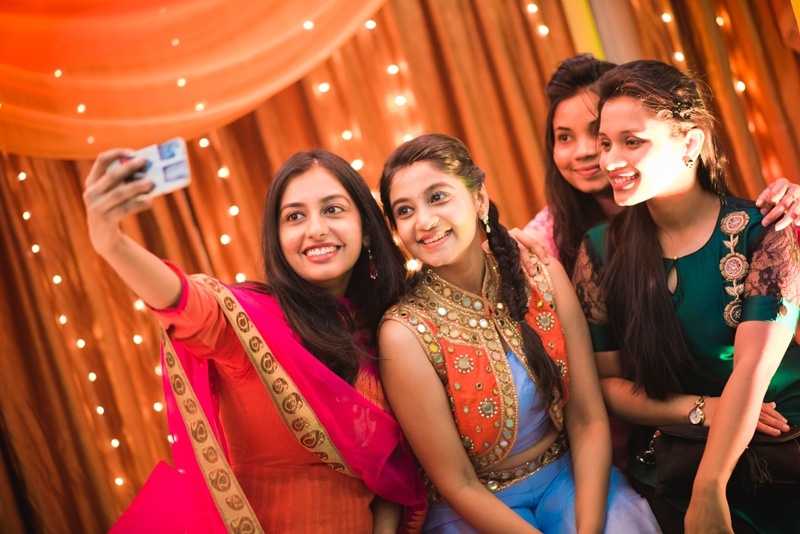 Held at Club Emerald, their sangeet was dance, hugs and love-filled! 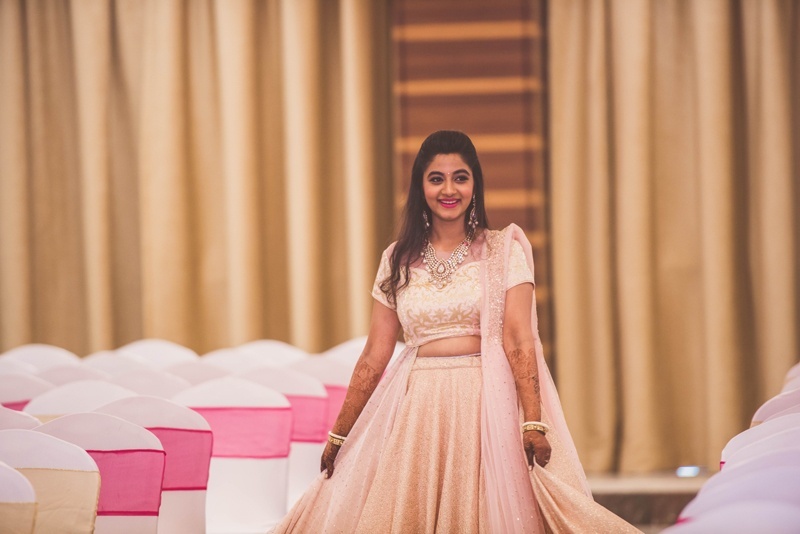 Veda donned a beautifully shimmery lehenga from Ishani Kamdar once again and wore gorgeous polki and pearl jewellery by Notandas Jewellers. 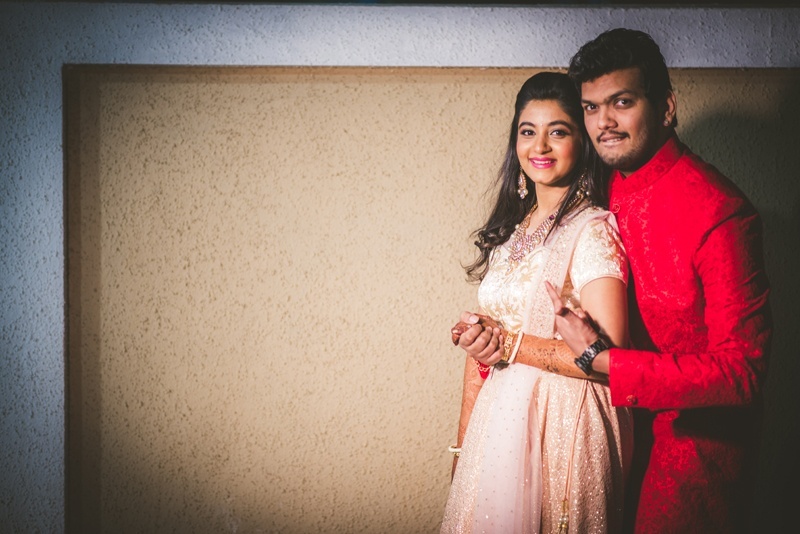 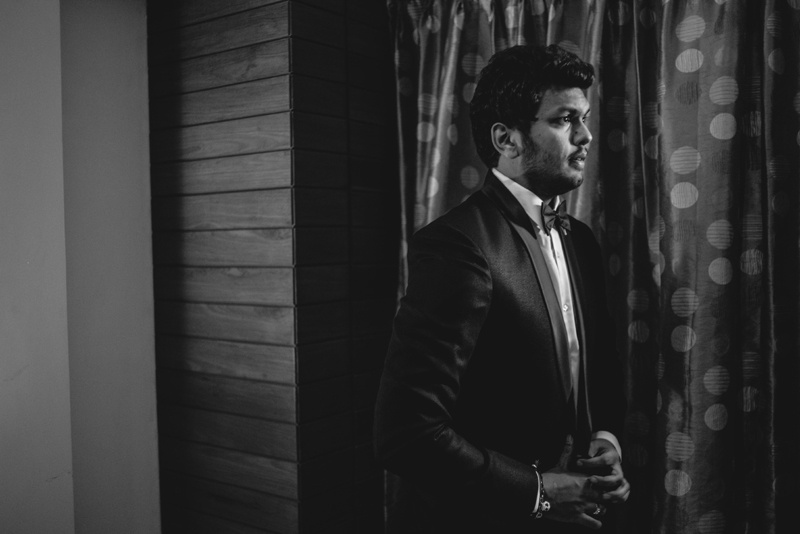 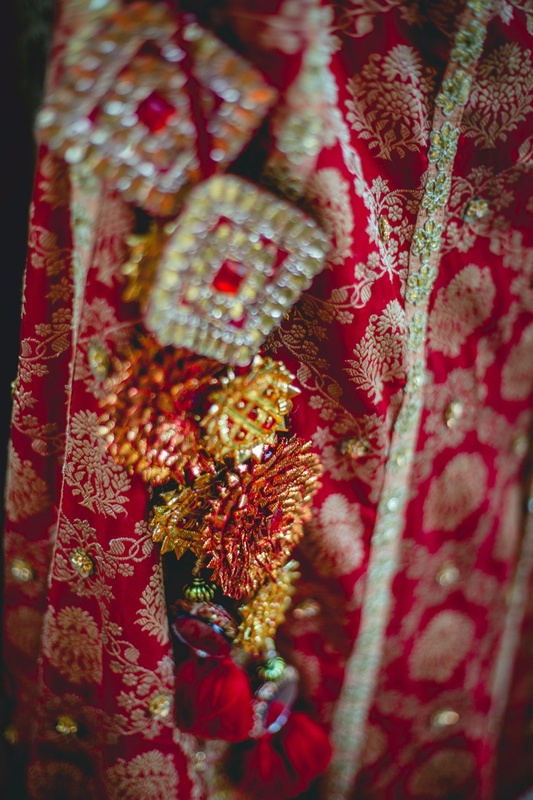 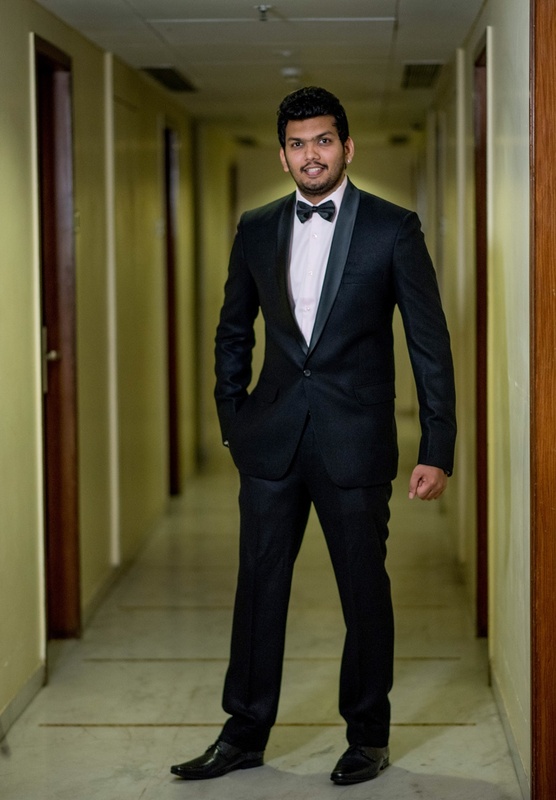 The dapper groom, Vishwanath complemented her perfectly in his deep red sherwani by Jinaam. 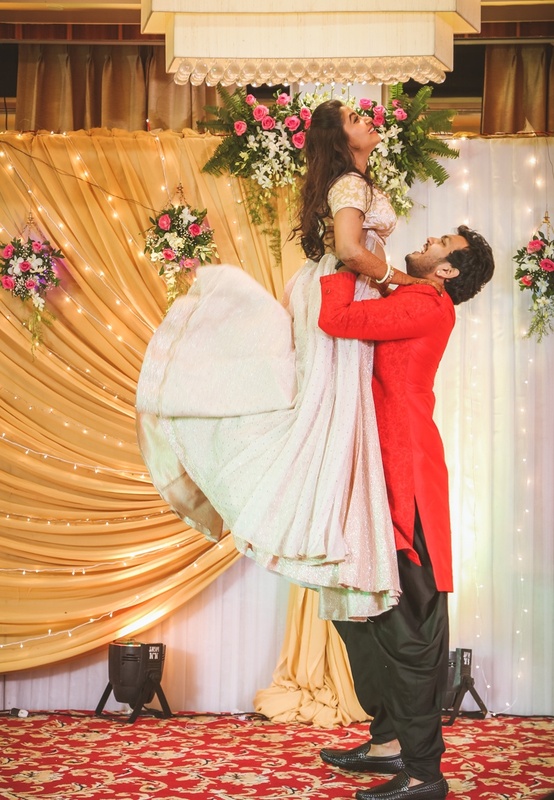 Looking no less than true Bollywood actors themselves, together Veda and Vishwanath, swirled and twirled to “Main Tera Hero” from the film Hero and the blatant love and happiness on their faces completely swept us off our feet. 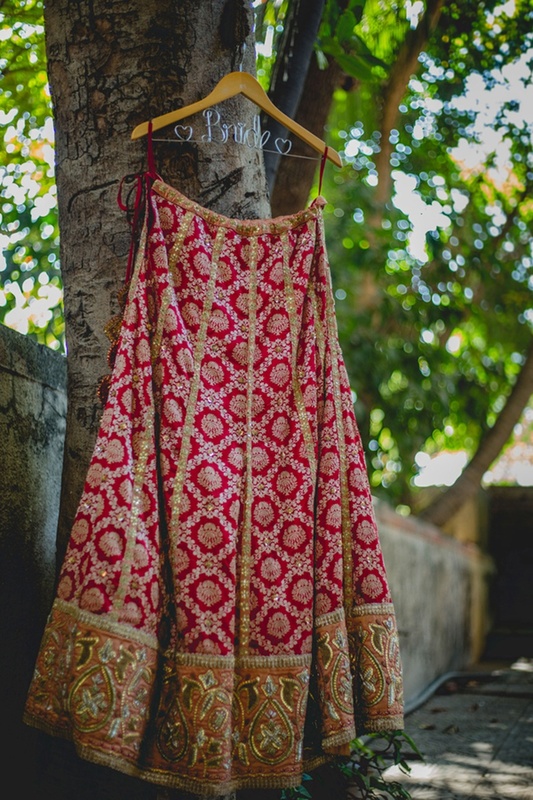 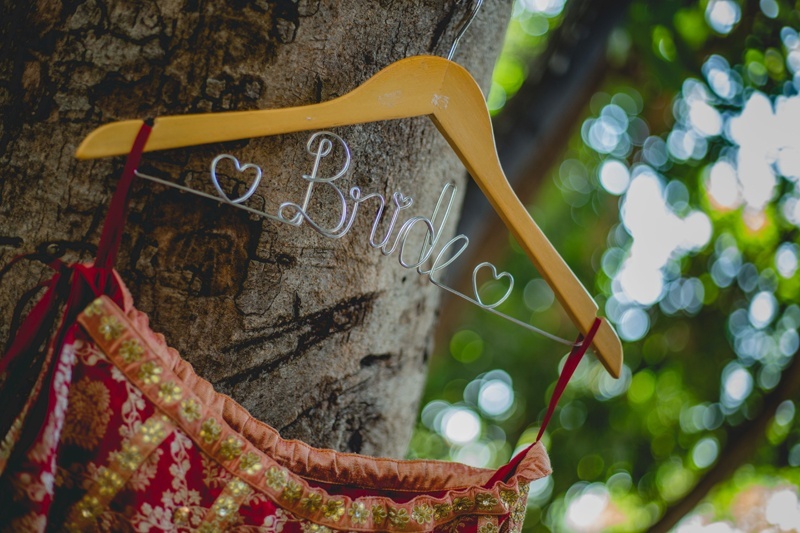 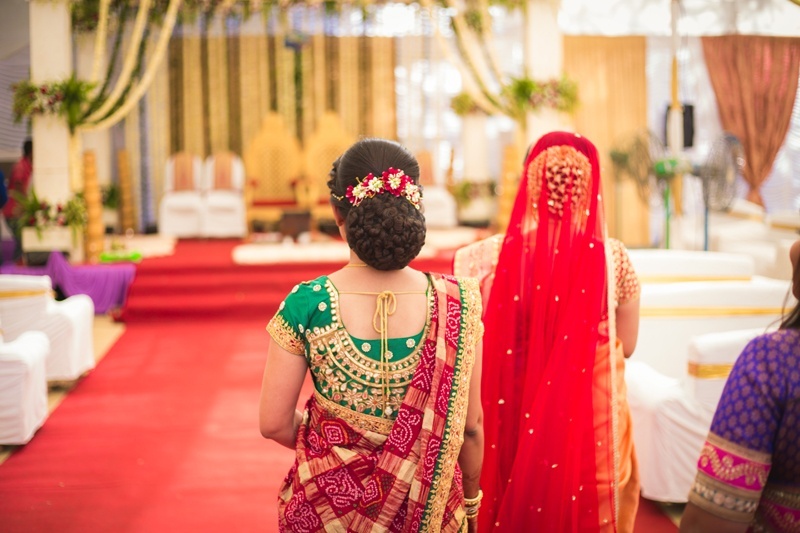 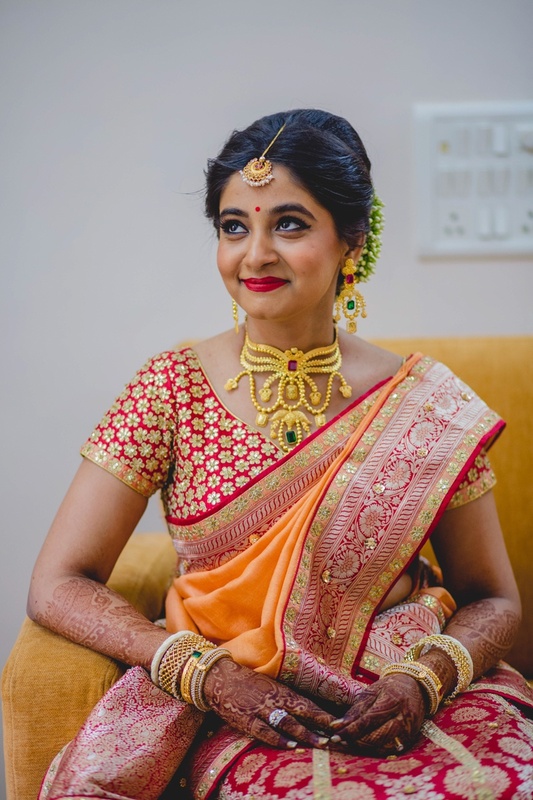 Our DIY bride, Veda with wedding lehenga designer Ishani Kamdar, took the traditional red and gold banarsi weaved saree from Ratan Shree Kheraj and turned it into a gorgeous wedding lehenga – brilliant idea for when you want to add an extra touch of personalization to your wedding ensemble. 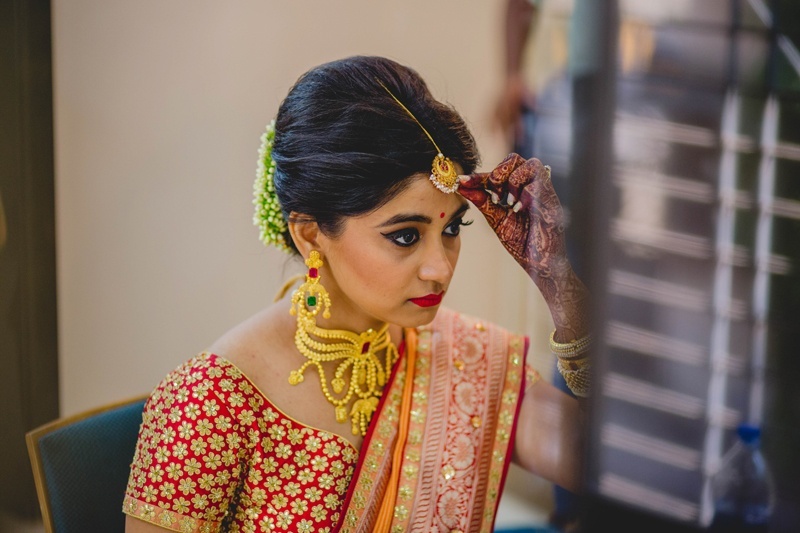 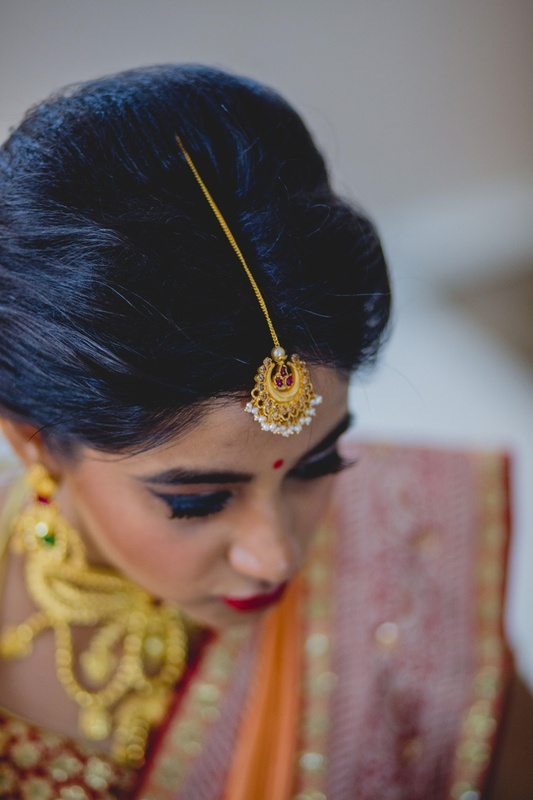 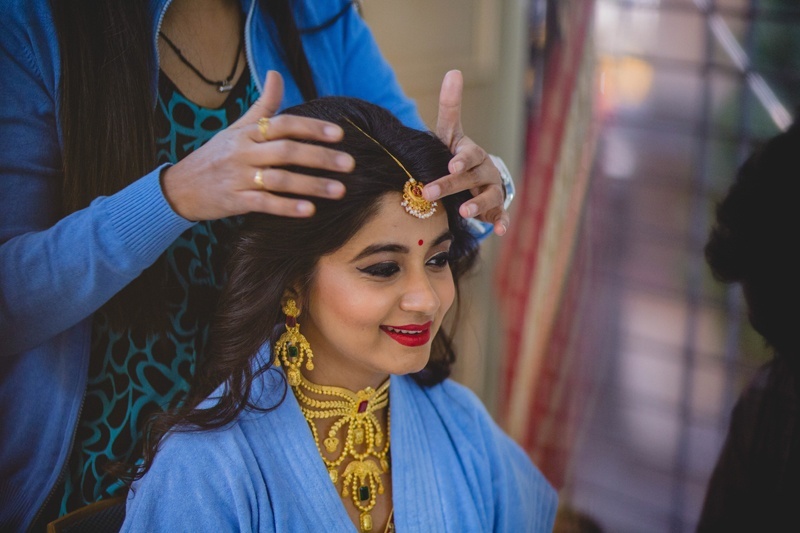 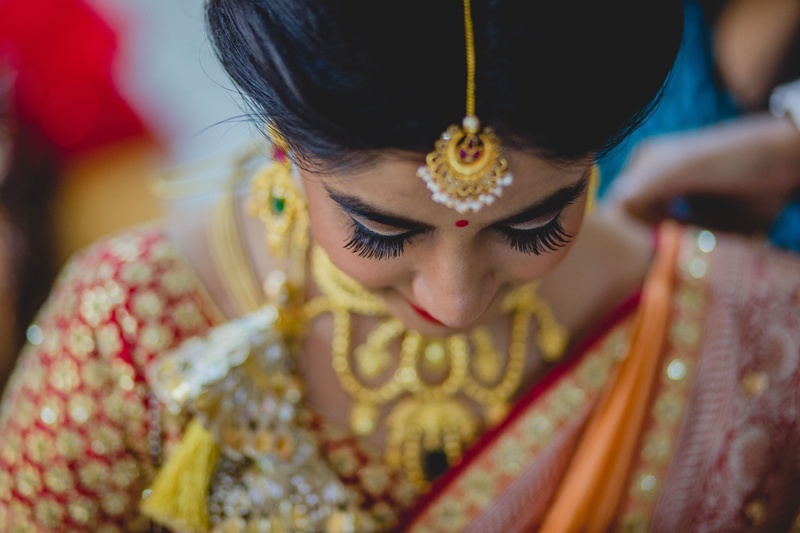 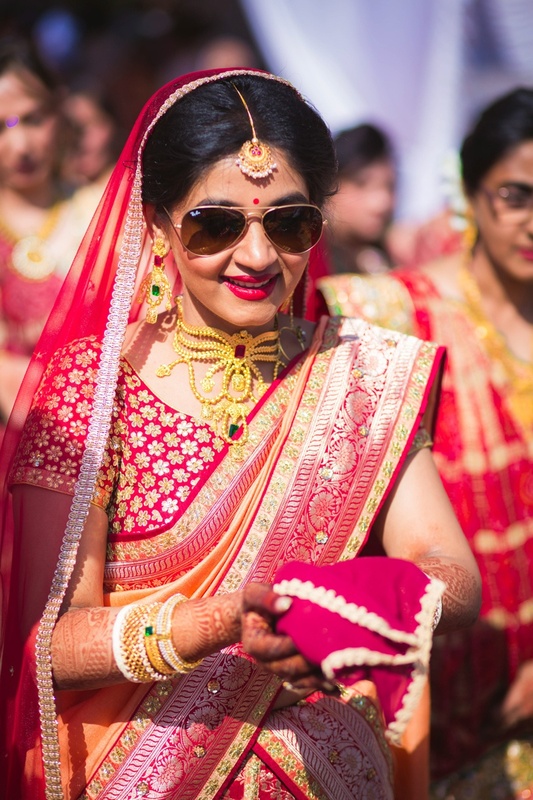 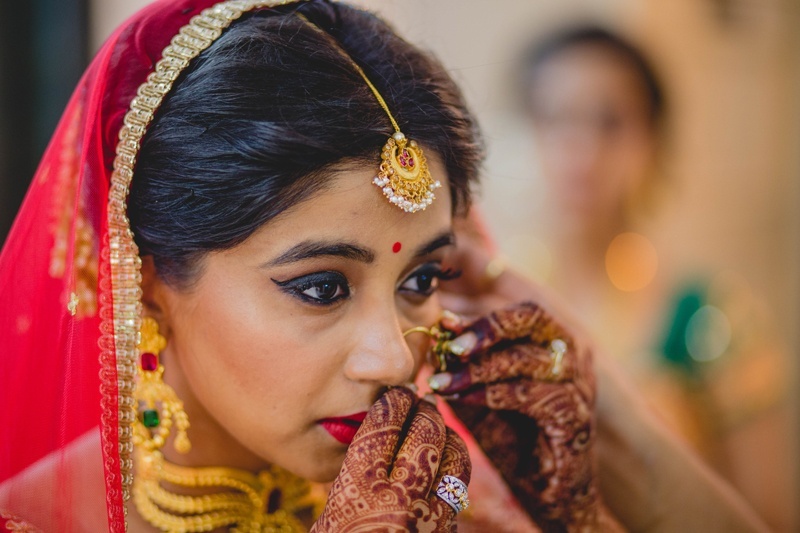 Let’s also take a moment to take in that stunning, stunning gold choker from Shilpa Ajani, the family jewellery of the bride, which took her entire look to new levels of bridal beauty. 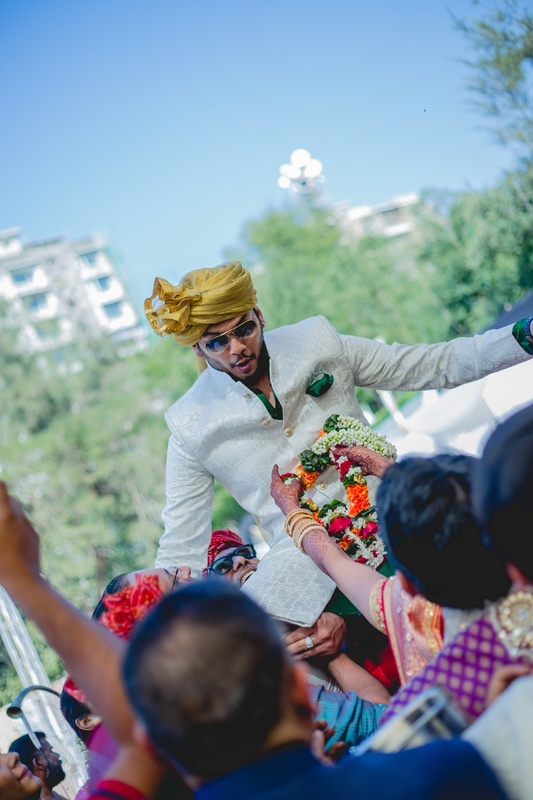 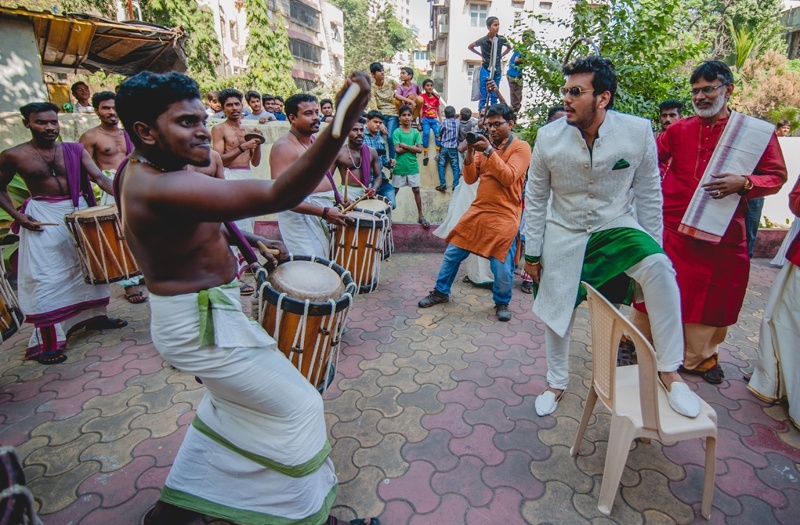 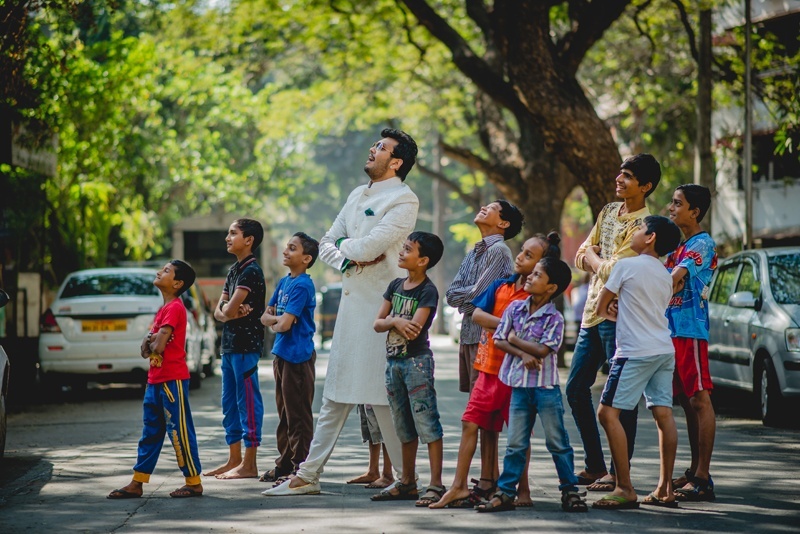 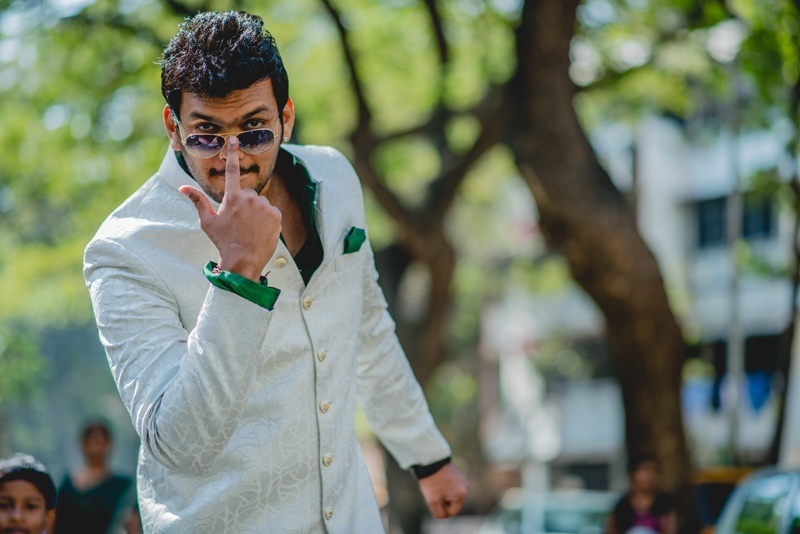 Even though the dapper groom, Vishwanath went with the classic off-white wedding sherwani from Telon, Juhu the emerald green kurta worn under his sherwani surely was a heart-stealer! 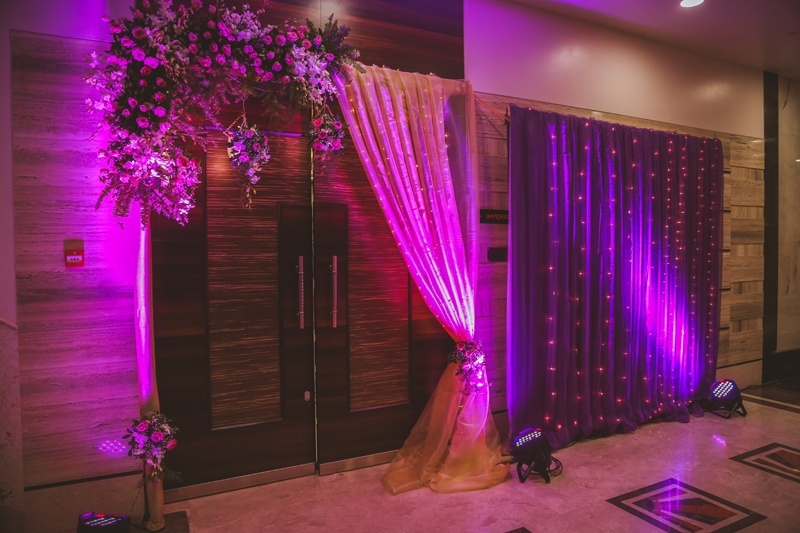 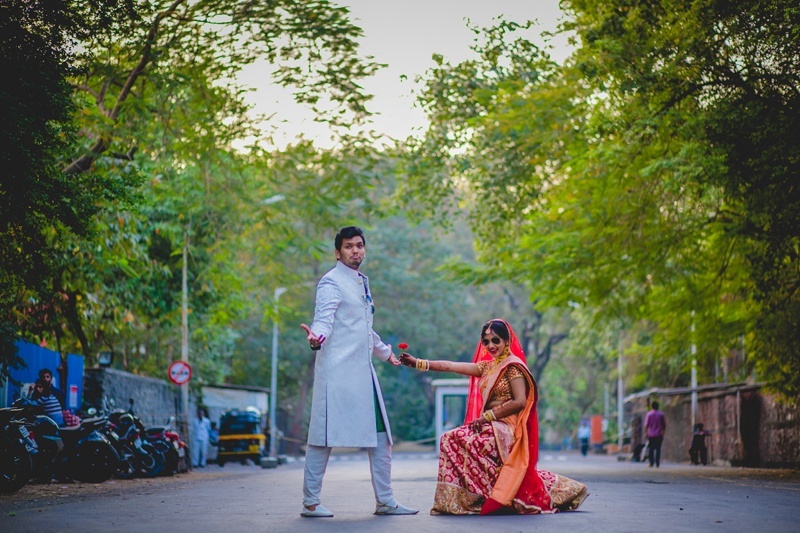 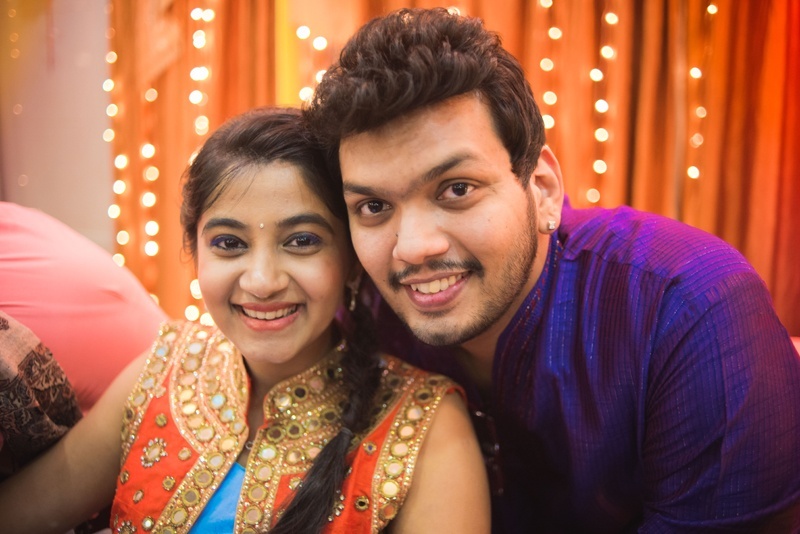 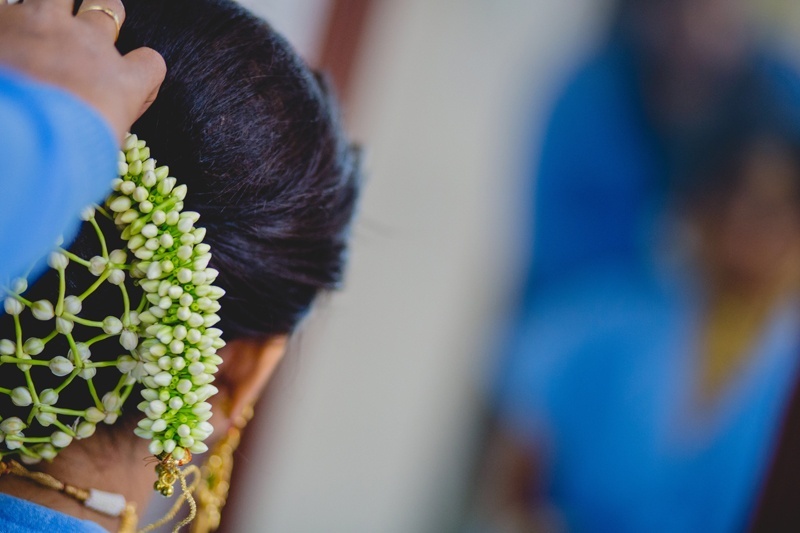 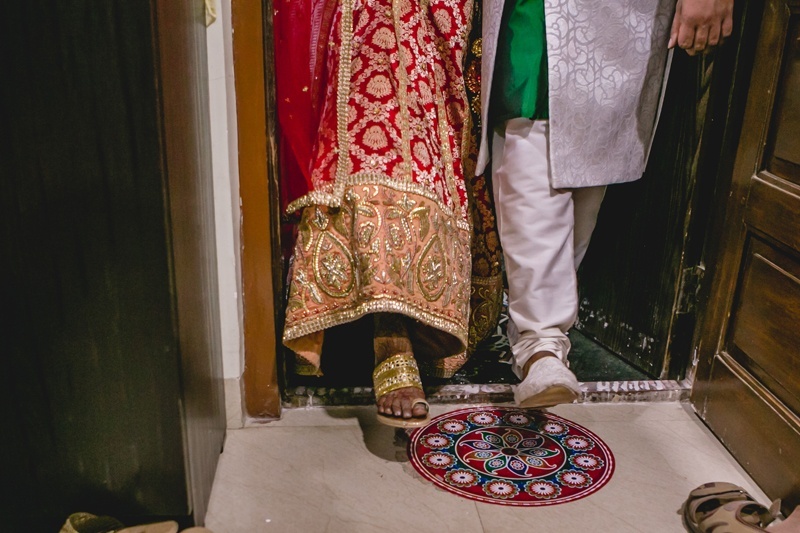 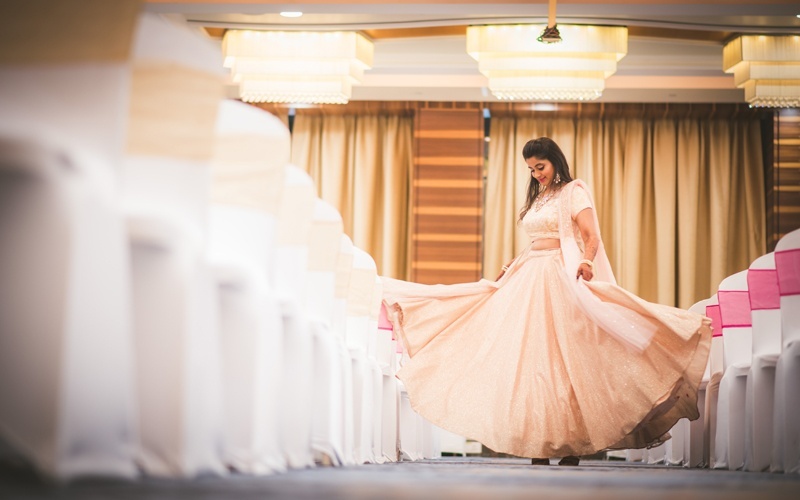 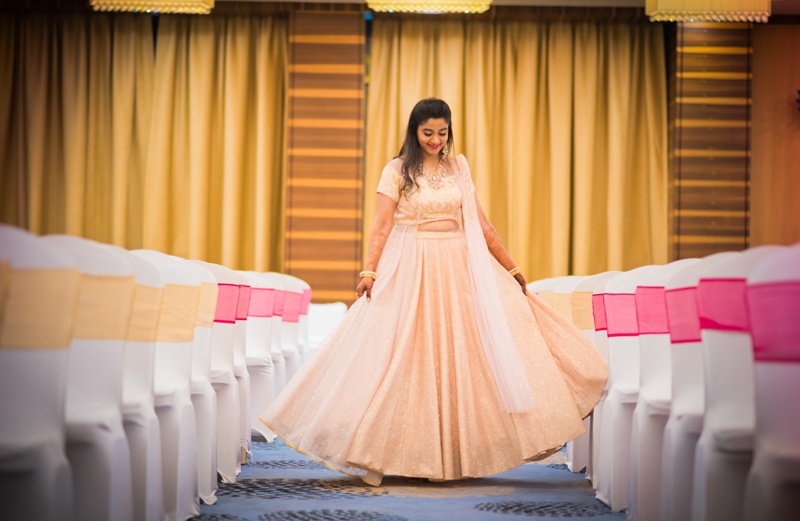 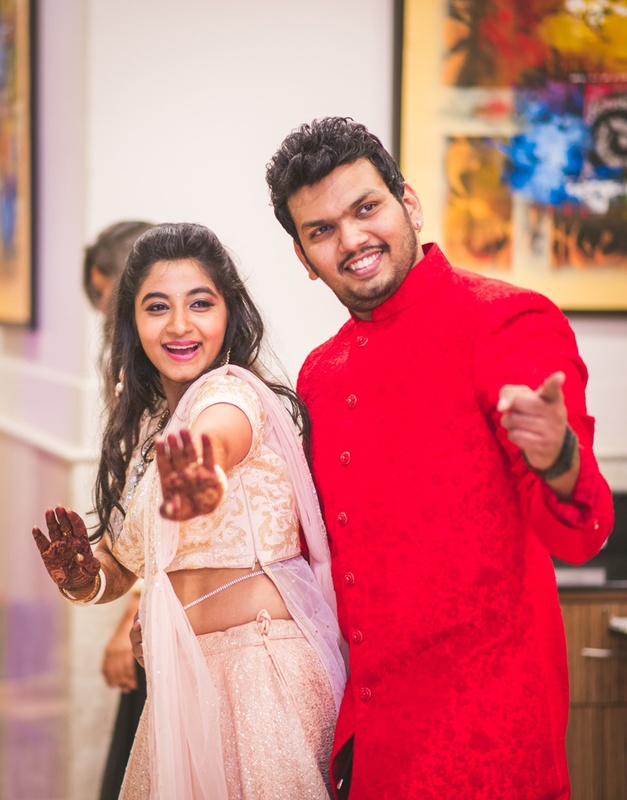 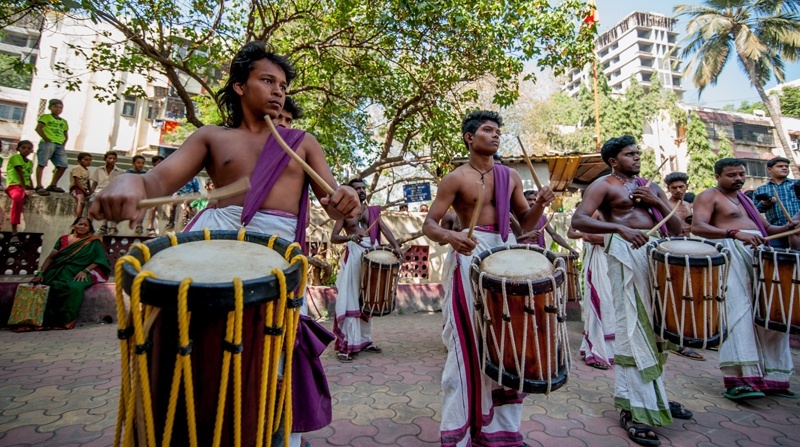 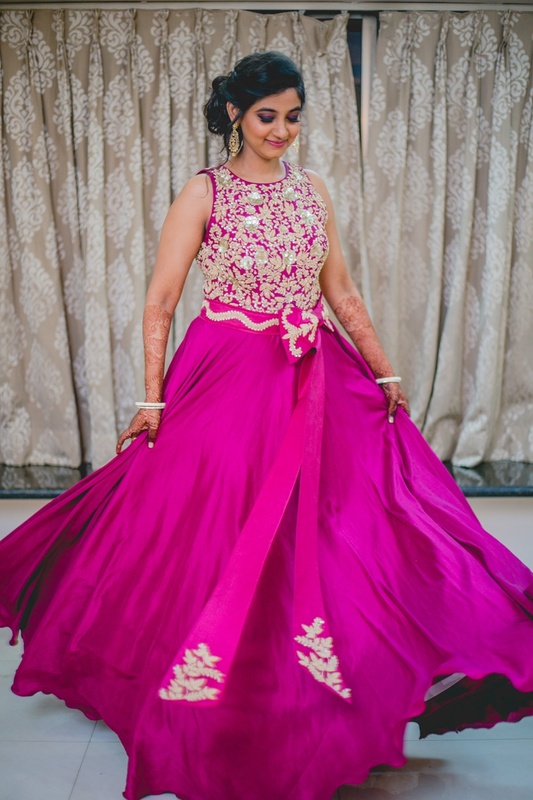 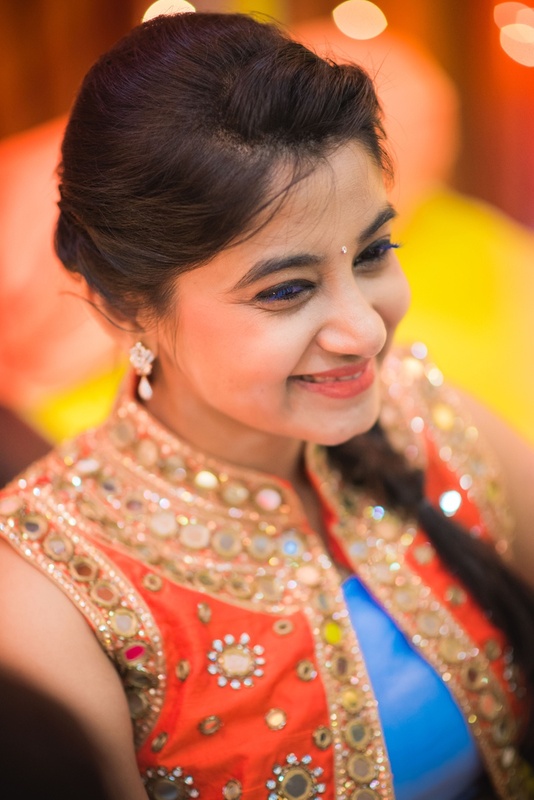 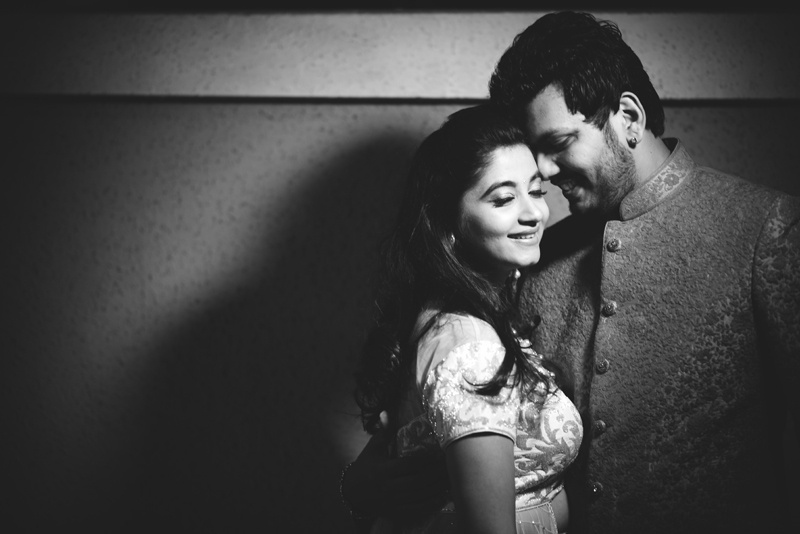 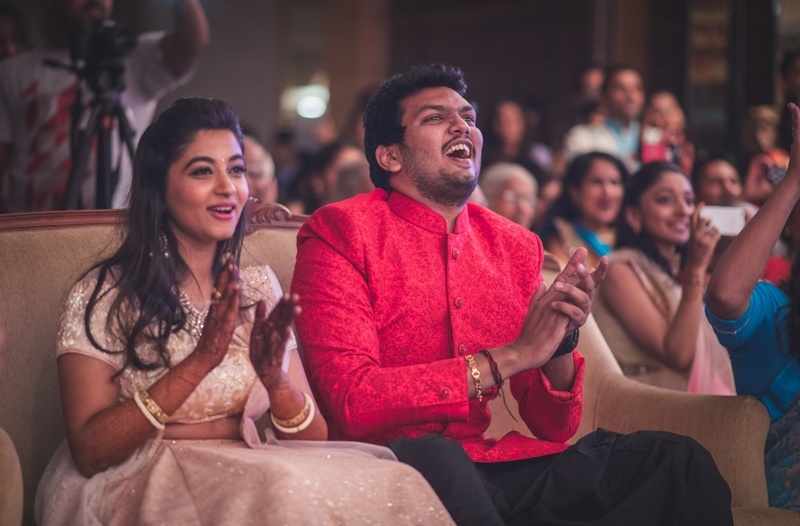 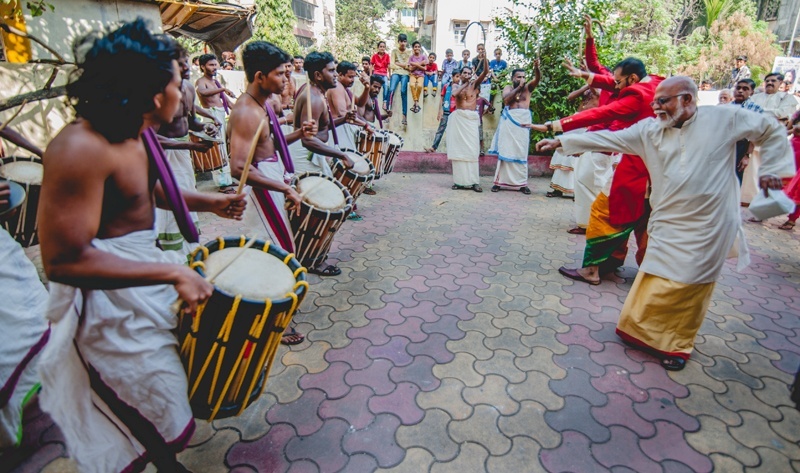 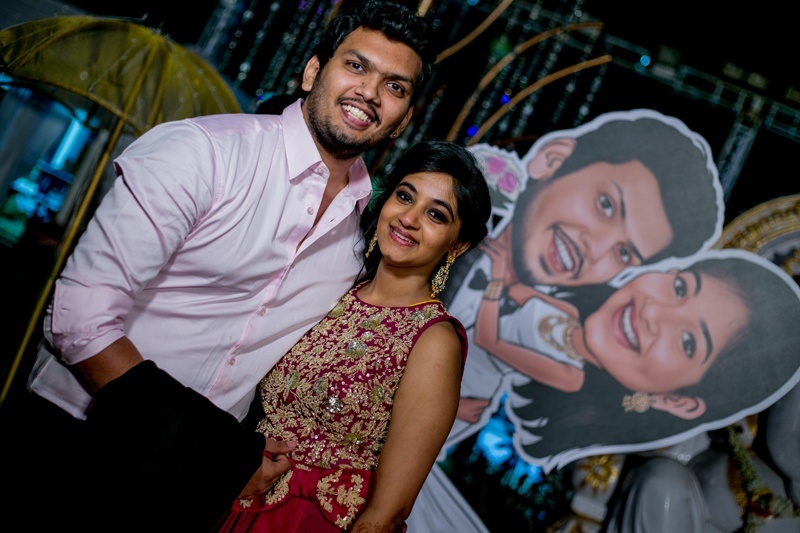 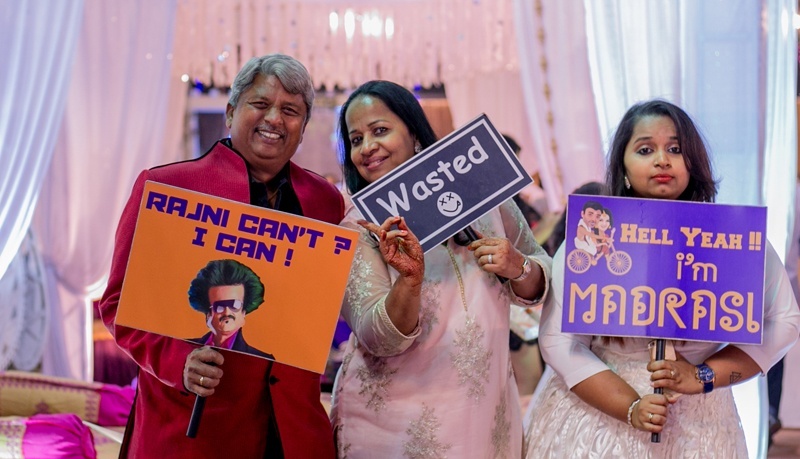 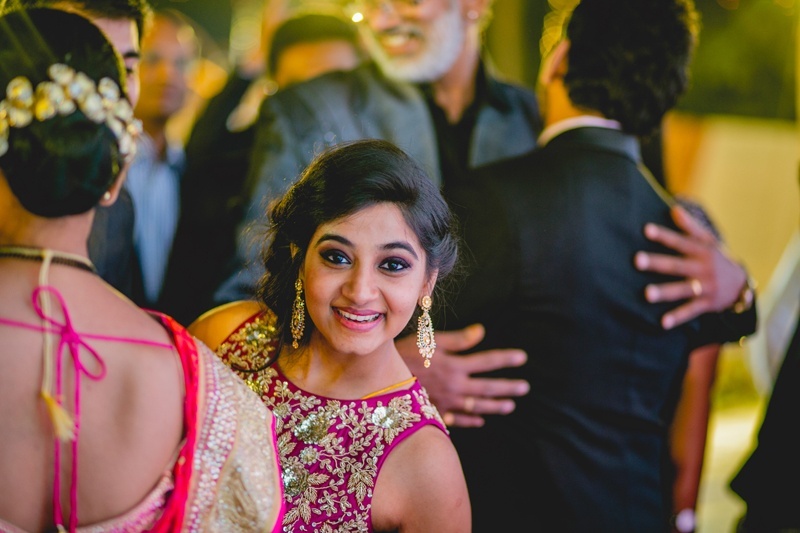 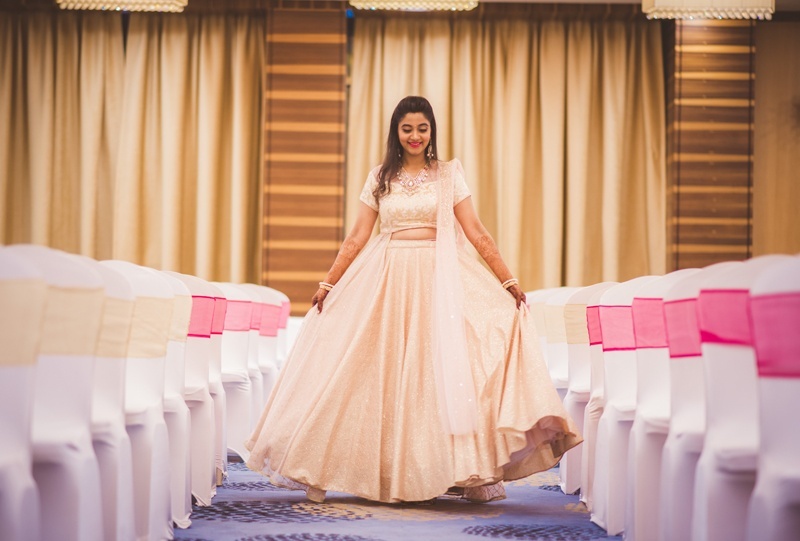 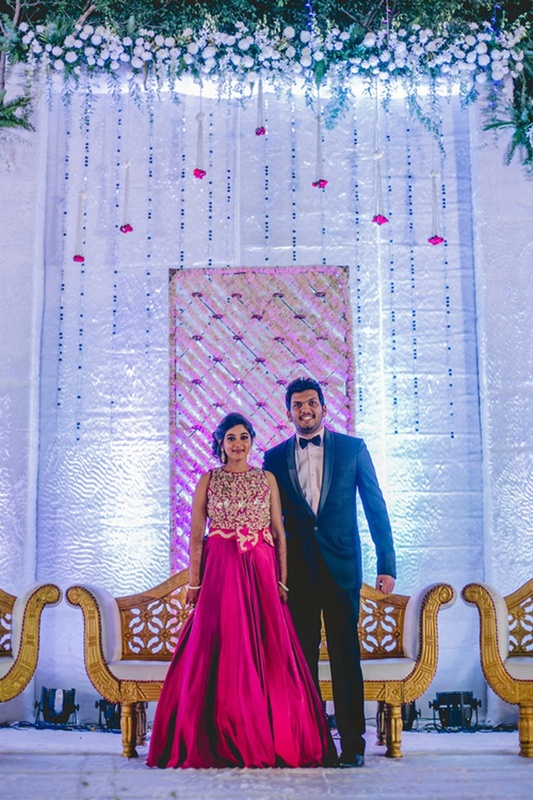 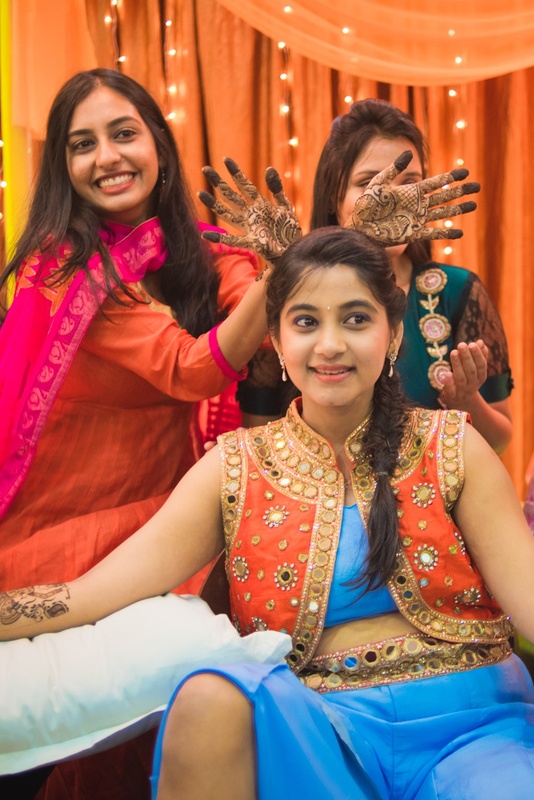 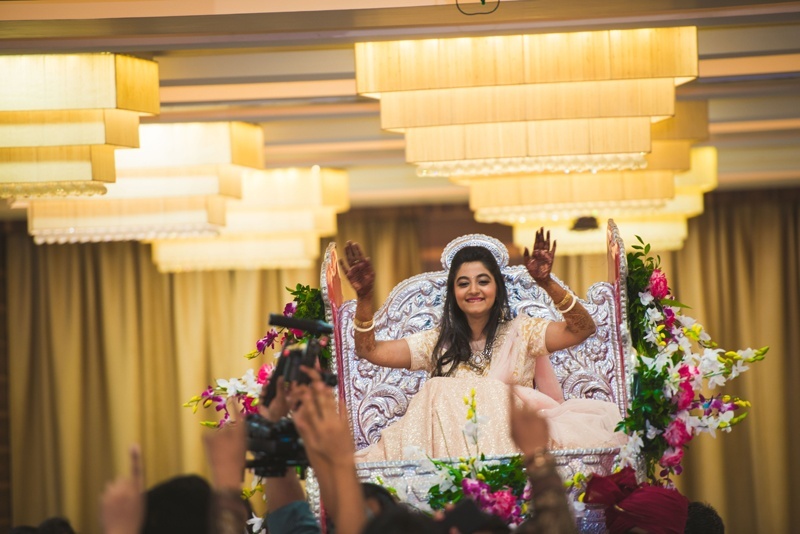 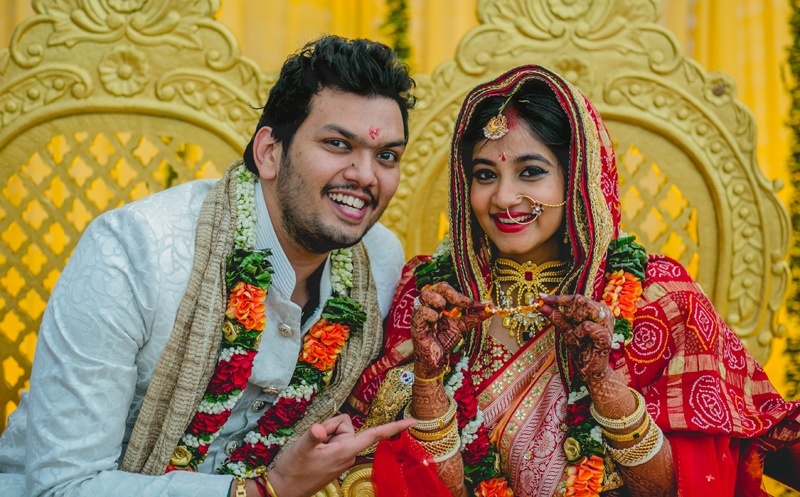 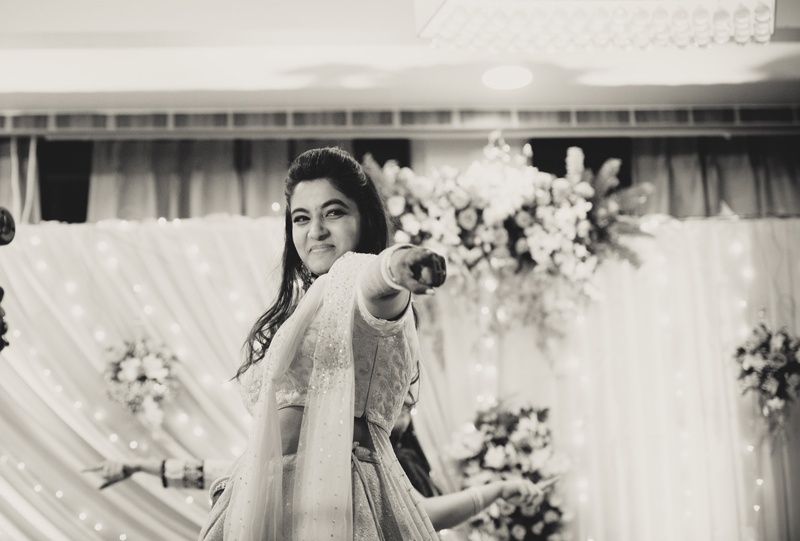 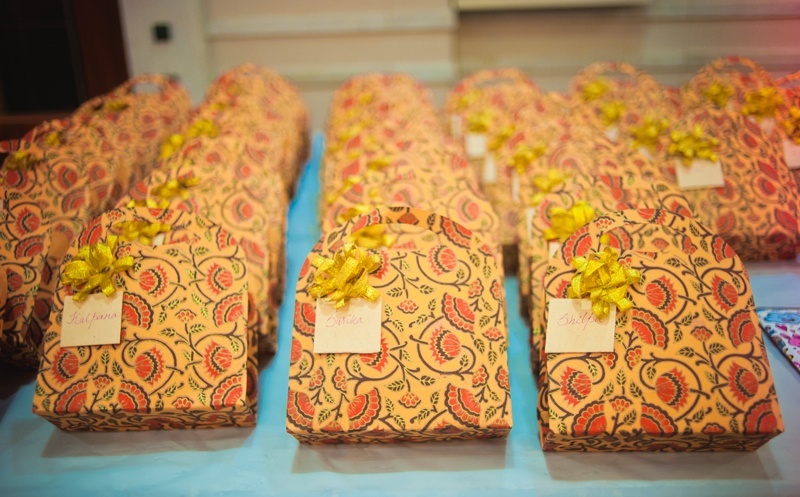 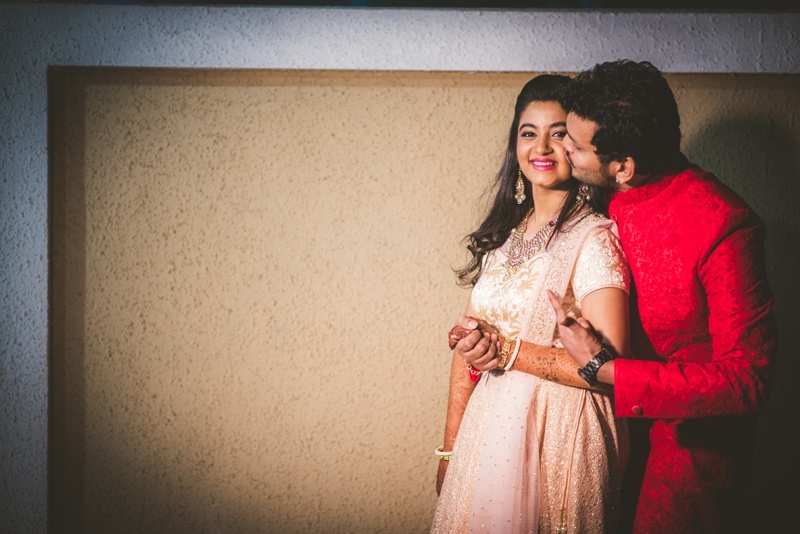 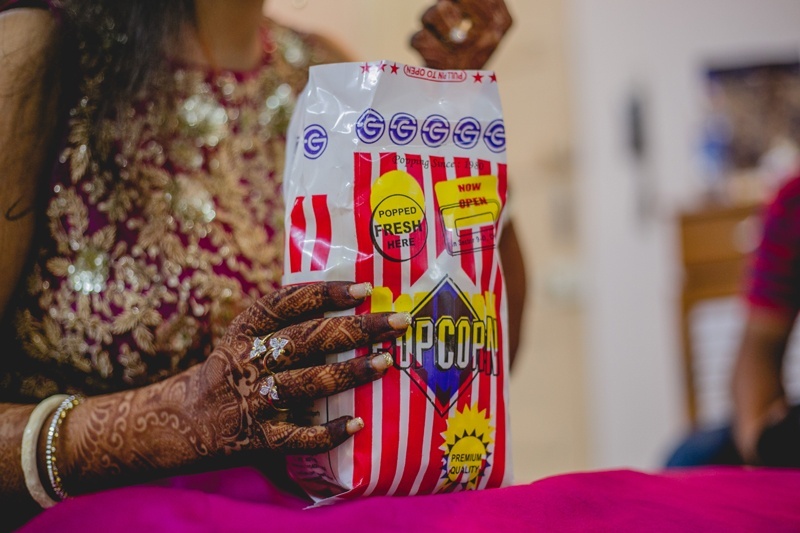 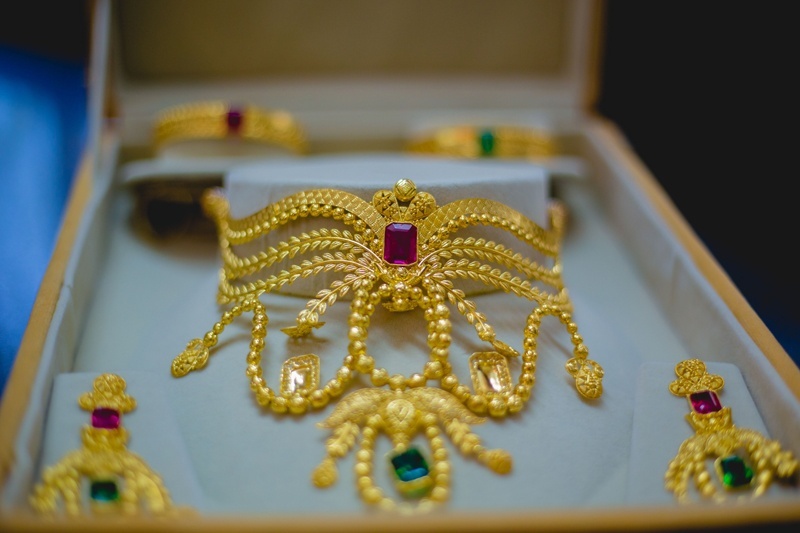 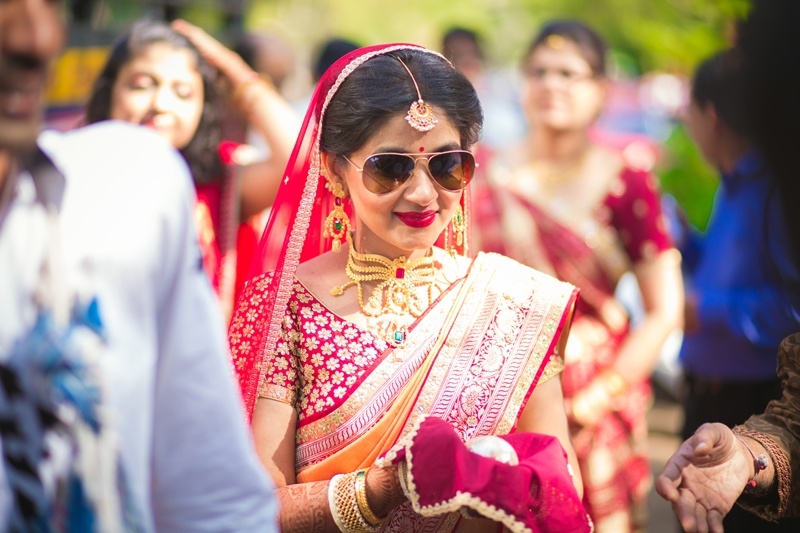 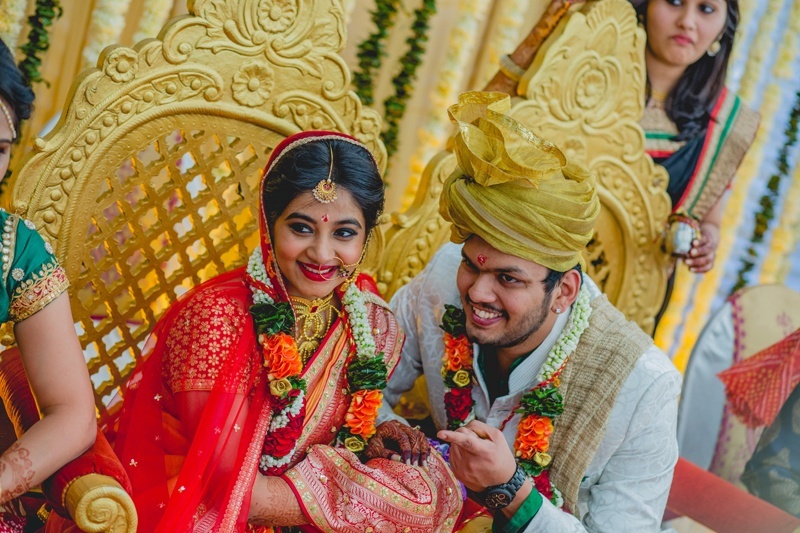 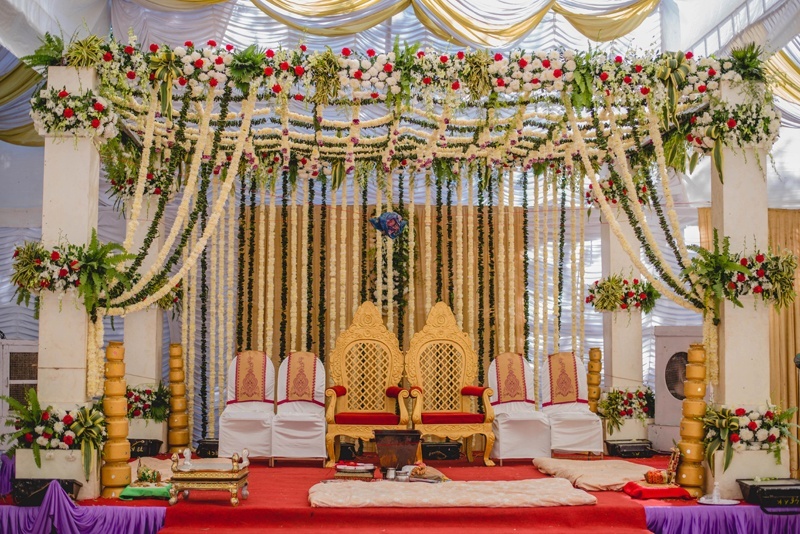 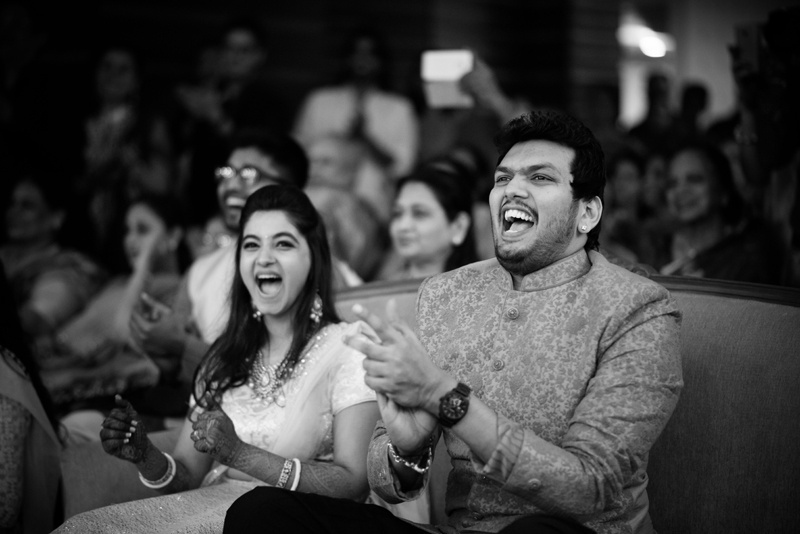 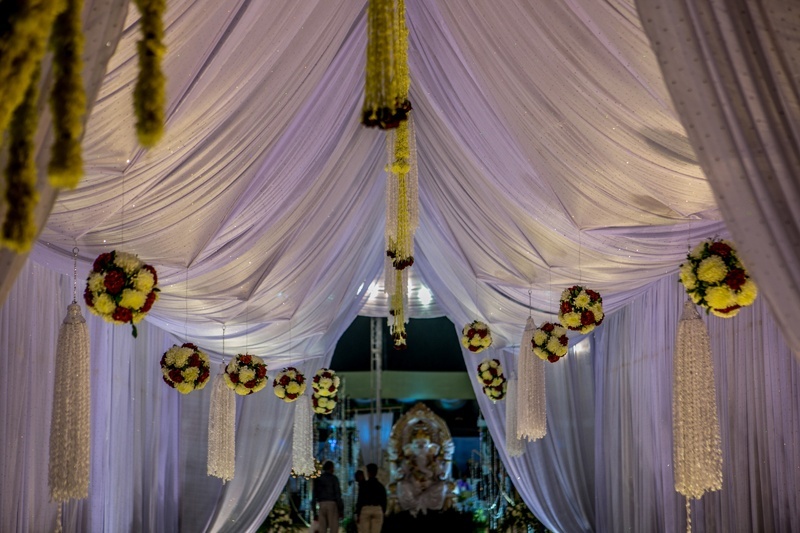 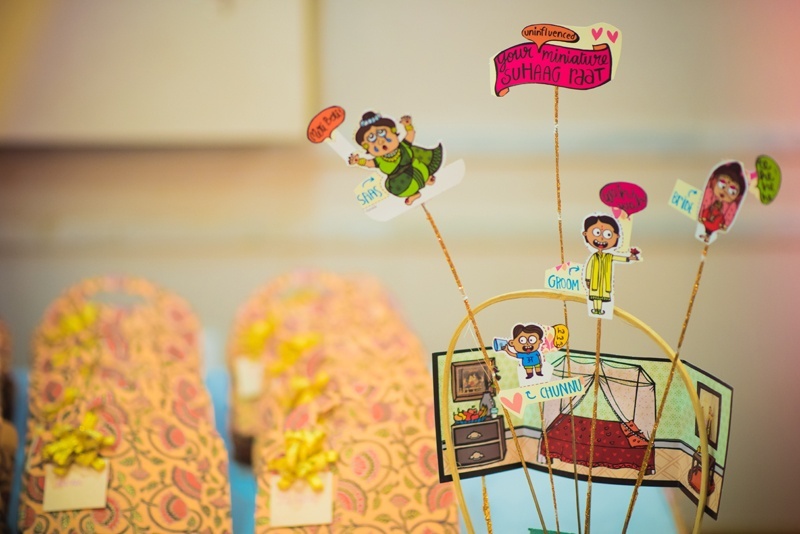 “Being the only daughter of my parents, they demanded that the marriage ceremony would be in complete Gujrati style, complete with the Kanyadaan, so we decided the best way to incorporate the Madrasi vibe to our wedding was to have the baarat in complete south-indian style!” And what a treat it was! 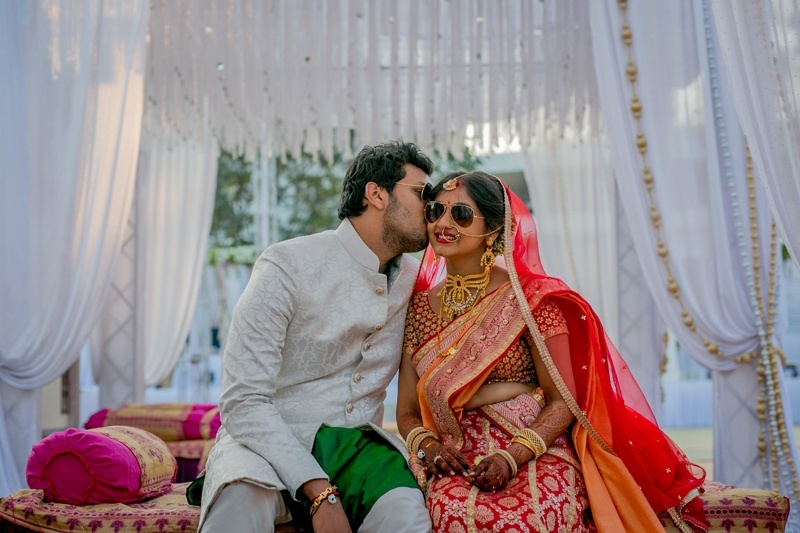 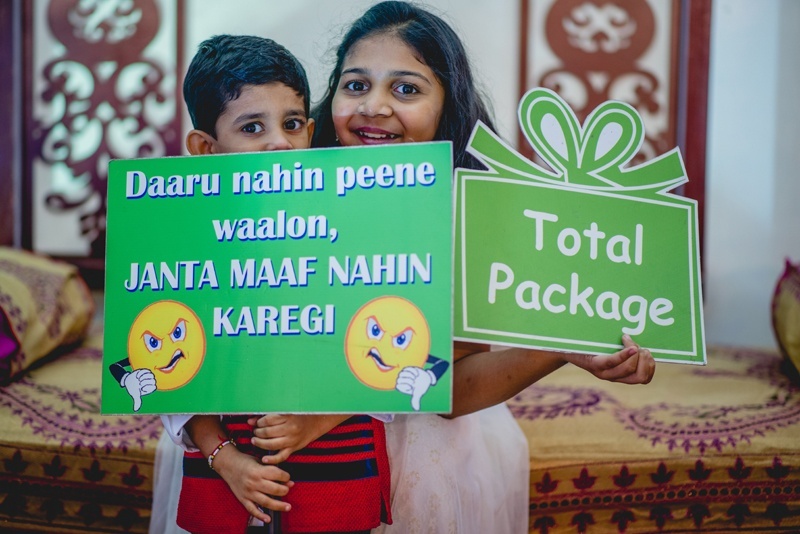 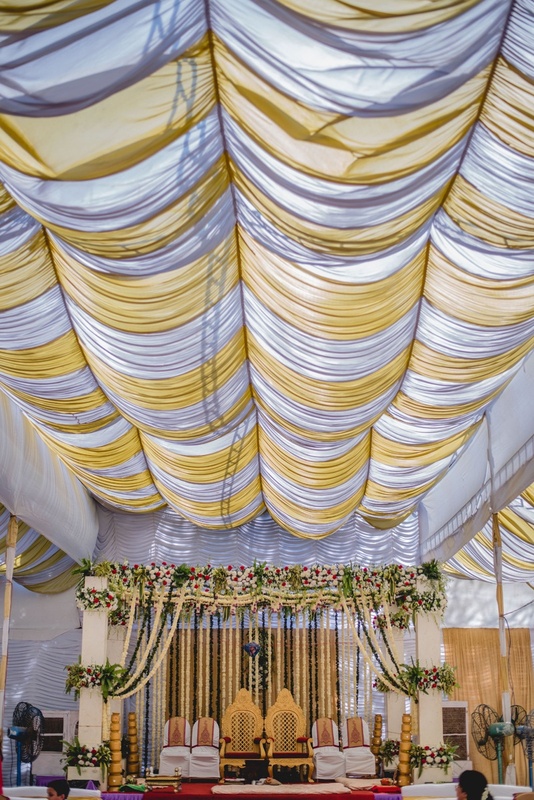 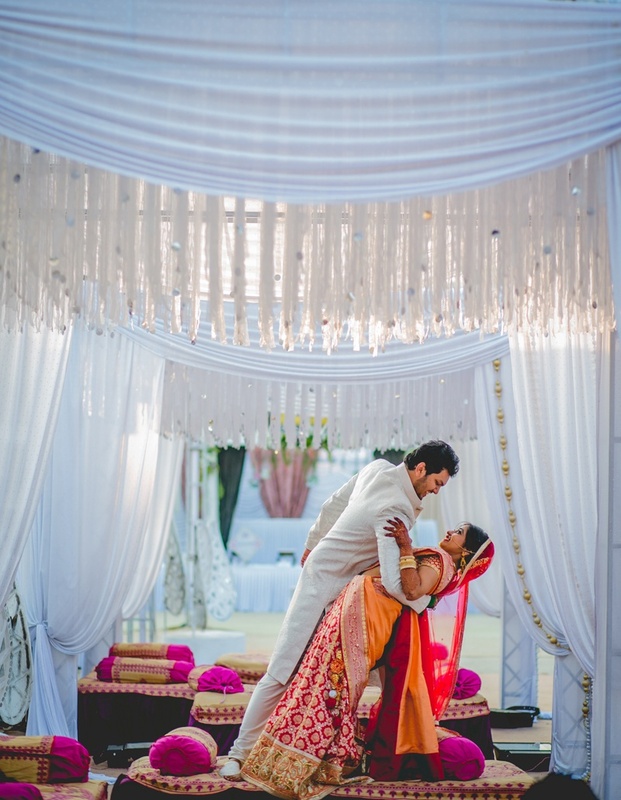 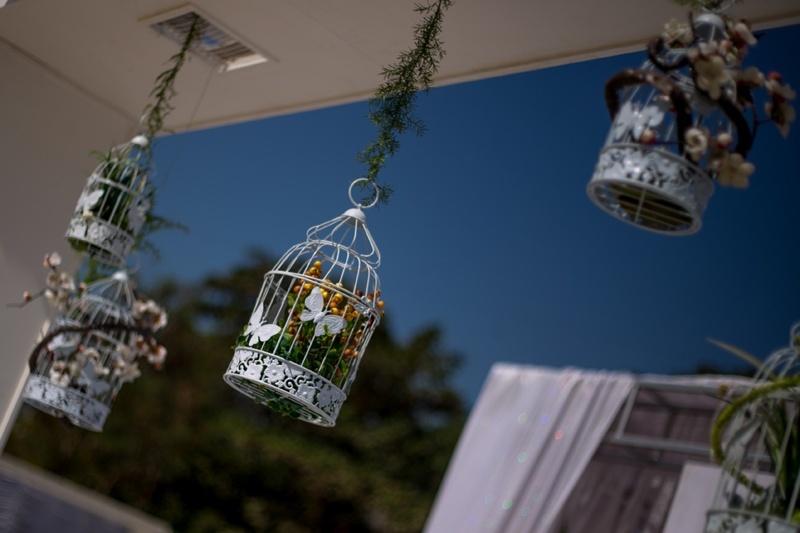 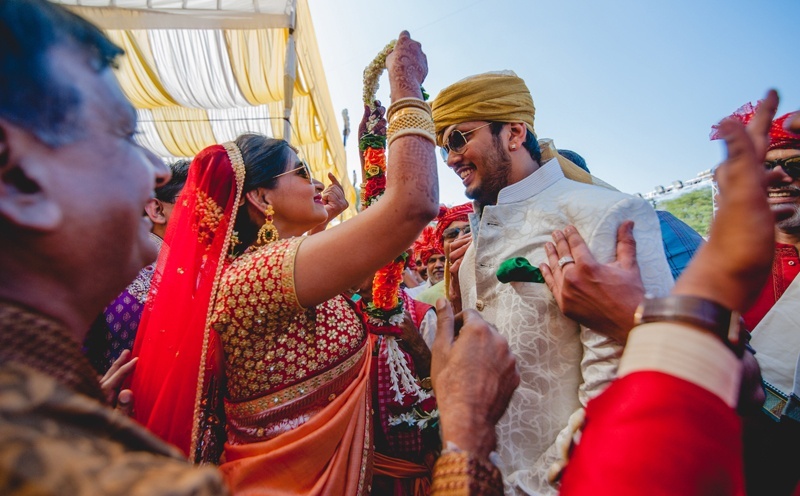 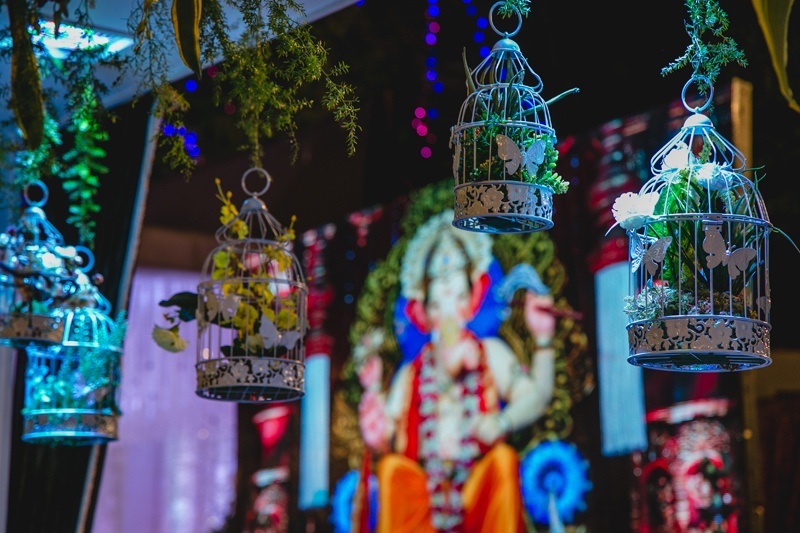 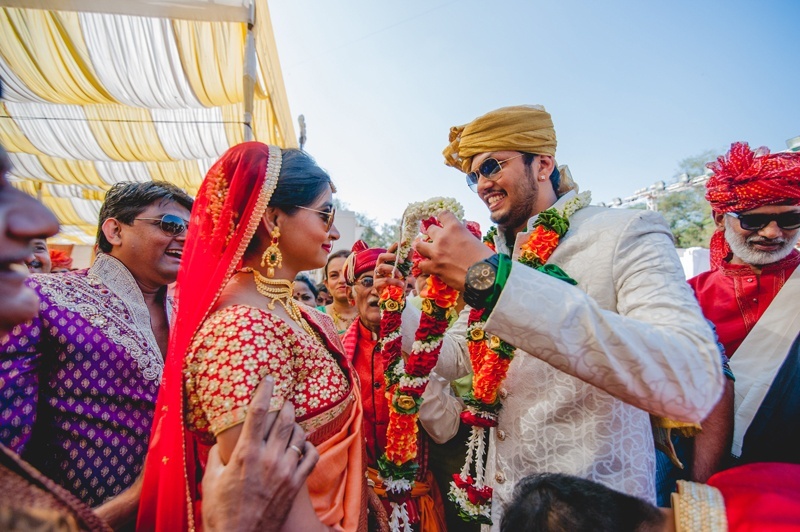 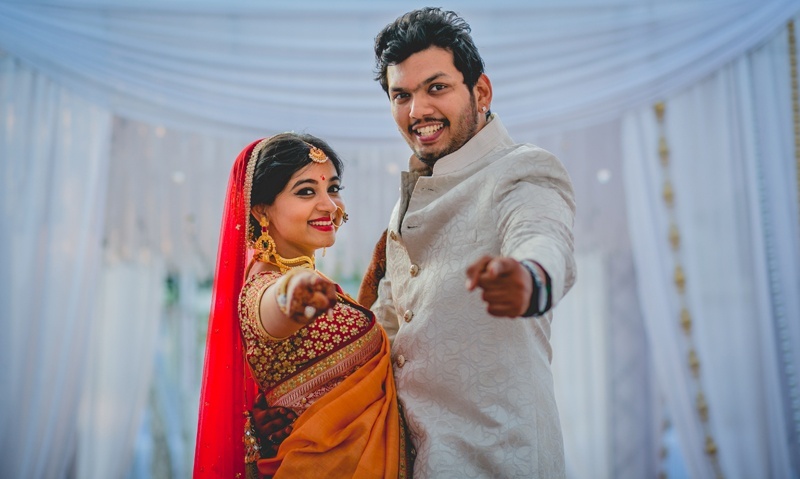 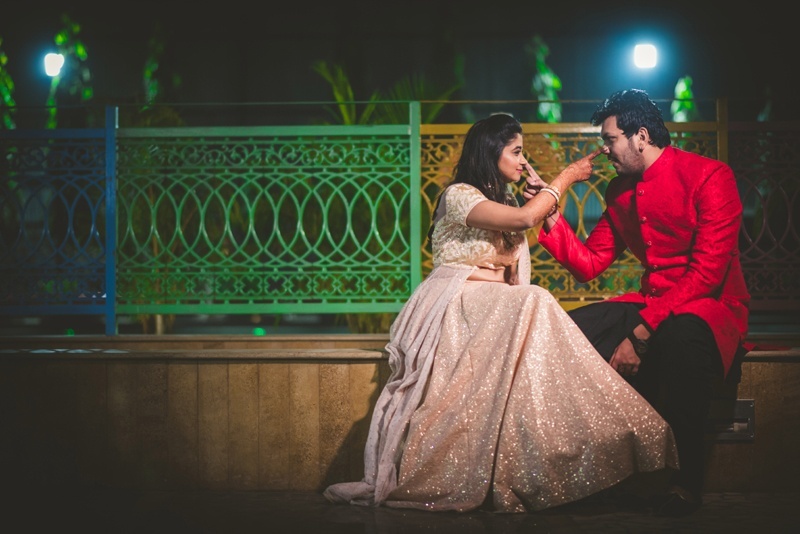 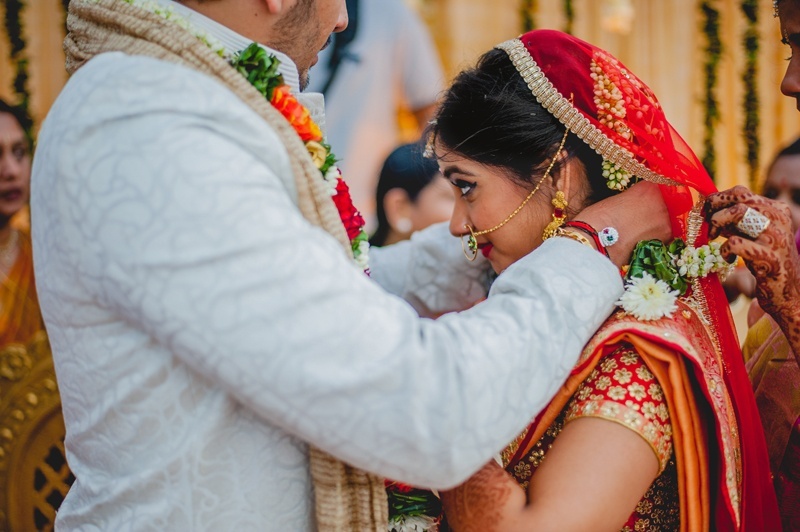 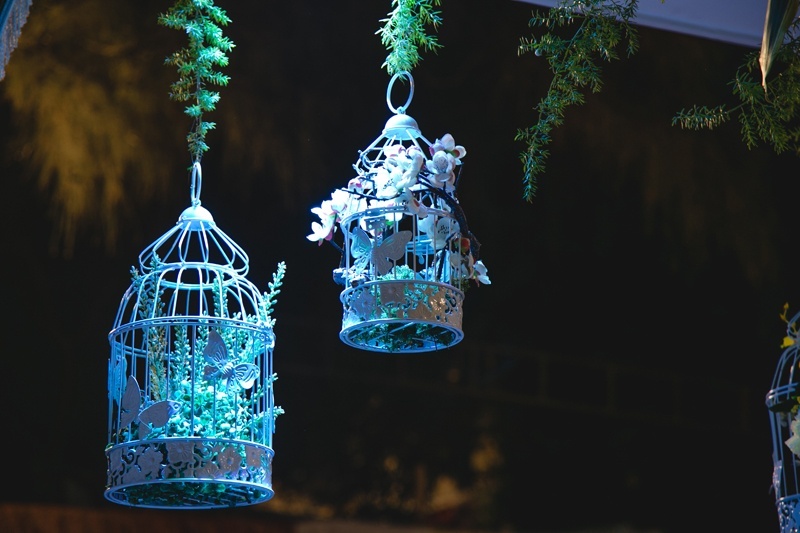 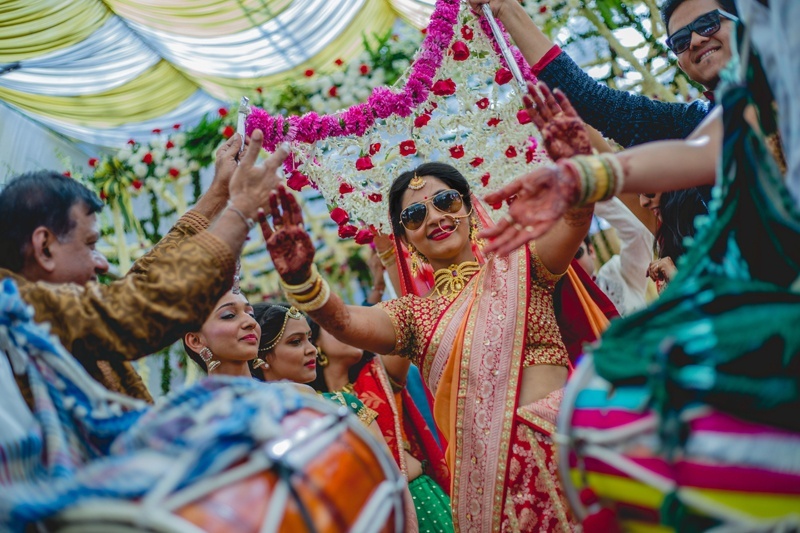 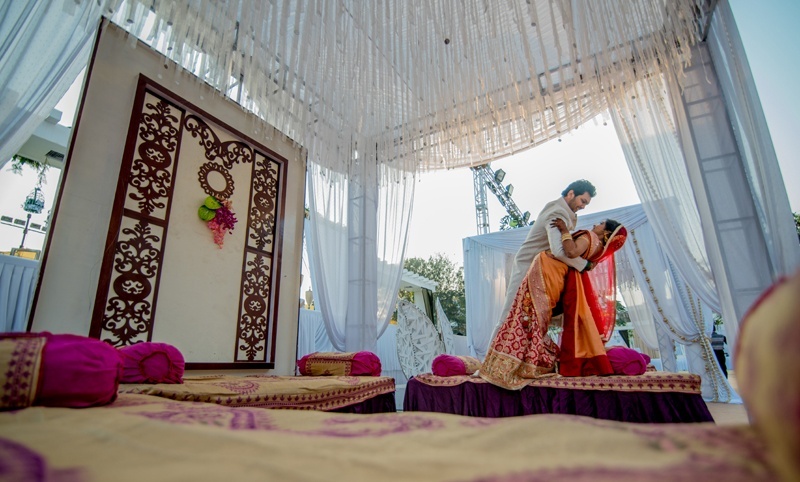 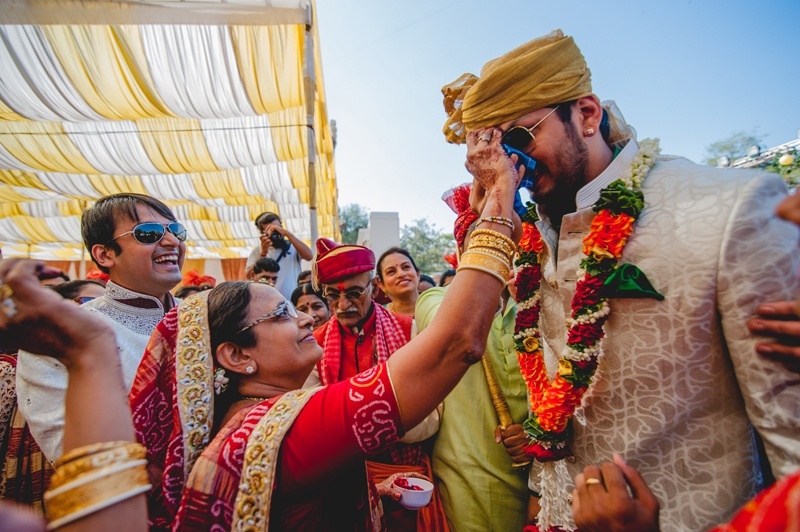 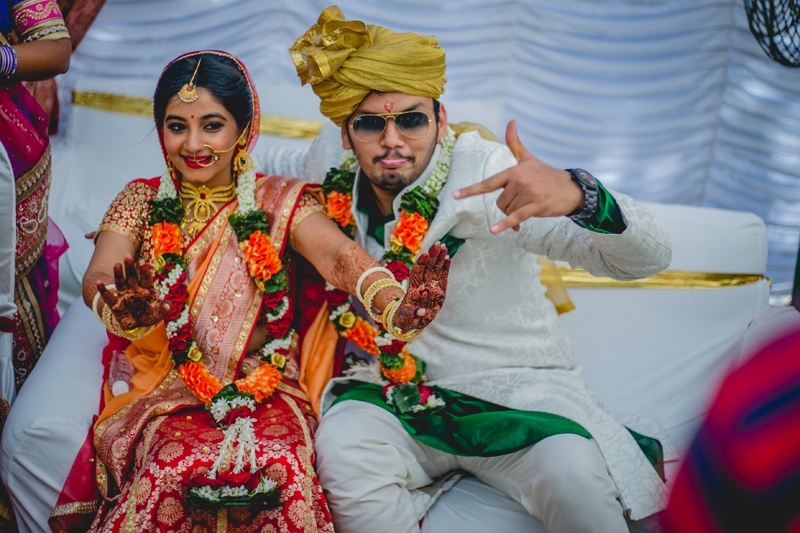 With lots of dhol baaja, naach-gaana and oodles of emotion, this couple went on to their floral mesh roofed mandap where they sealed the deal on love forever! 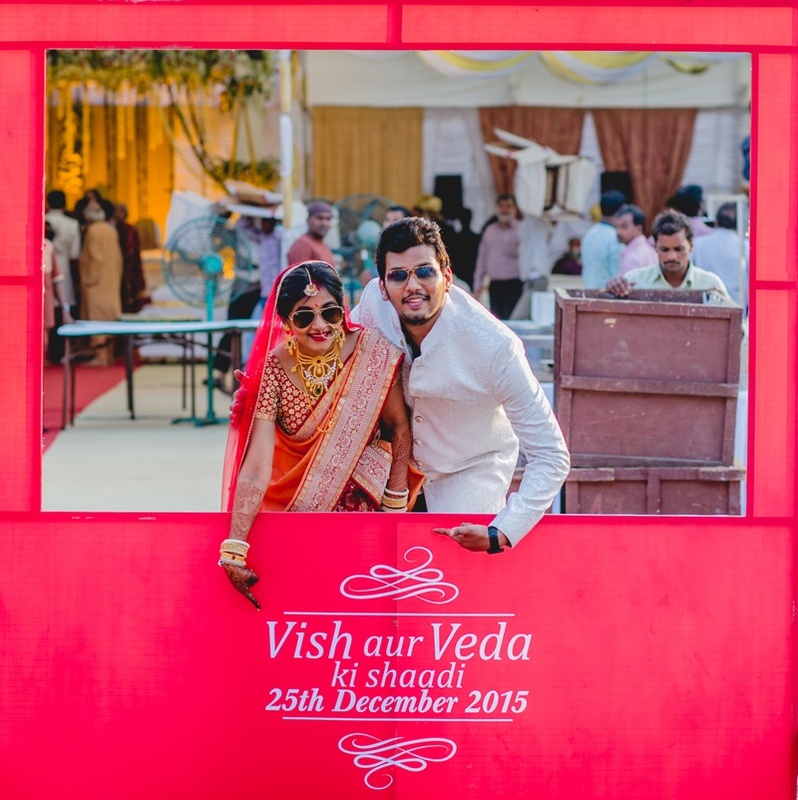 Vishwanath doing it the right way! 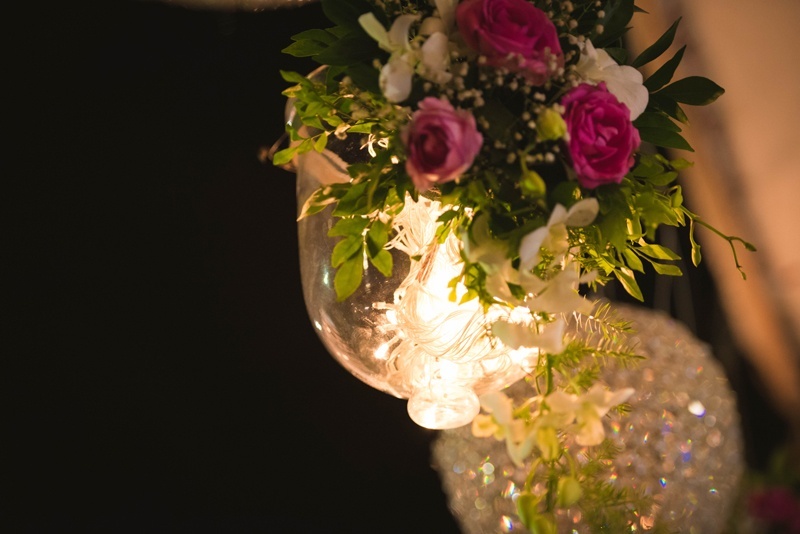 Crystal bowl hung with fairy lights! 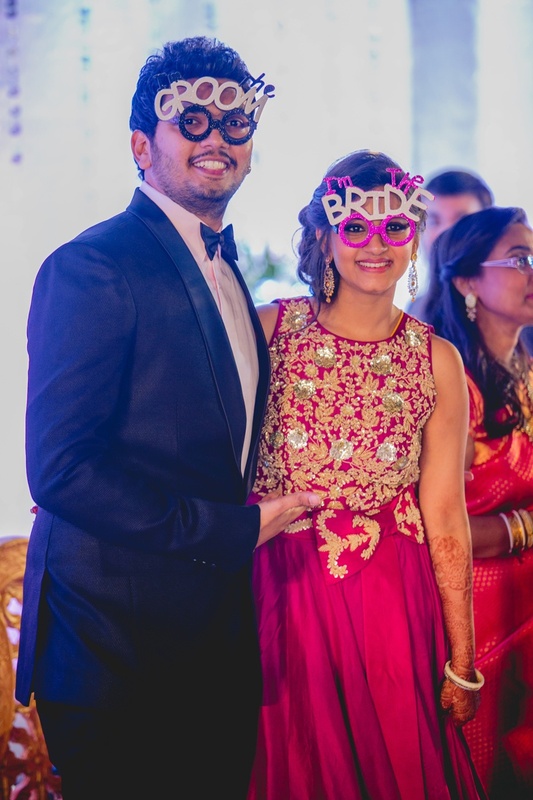 Donning quirky glassed with initials of the bride and groom!